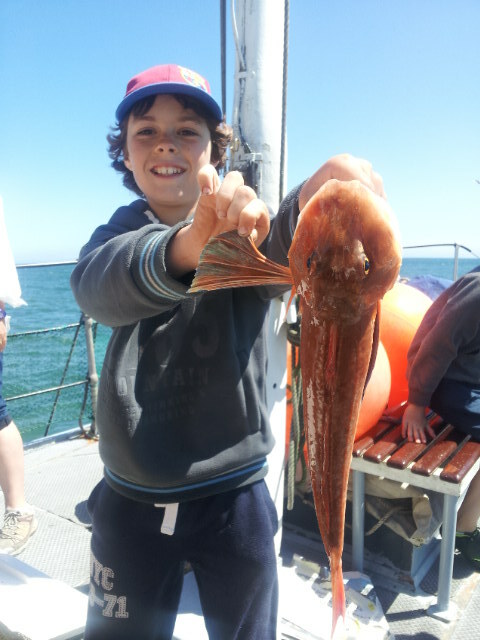 The African Queen 2013 Diary Page. 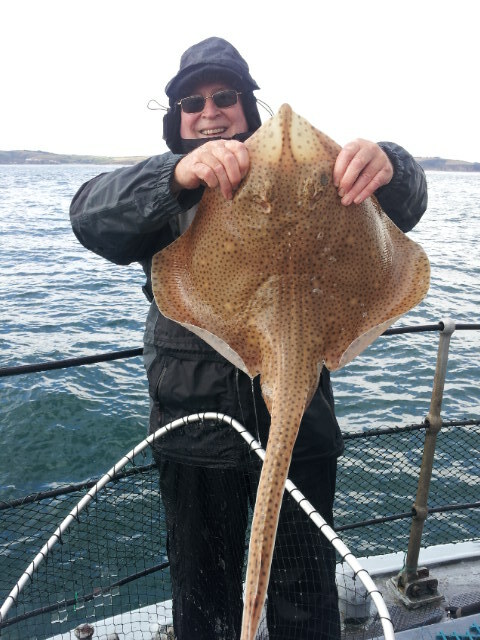 See what we get up to this year. January 2013. 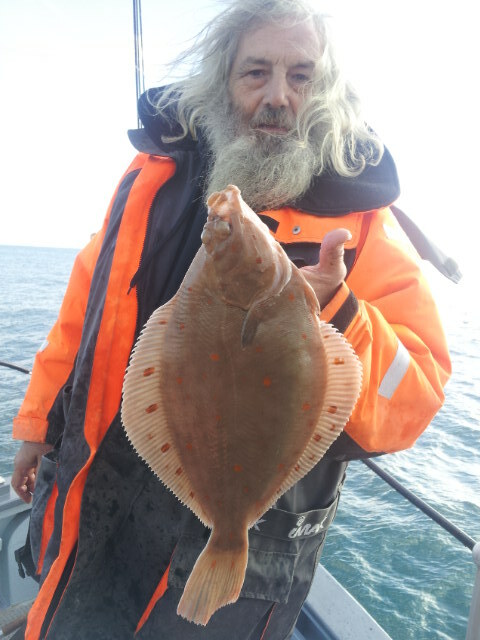 Nothing much to report yet unfortunately, the weather is just diabolical, winds are consistently strong and are stopping us from taking advantage of the few bookings we actually get at this time of year. February/March. 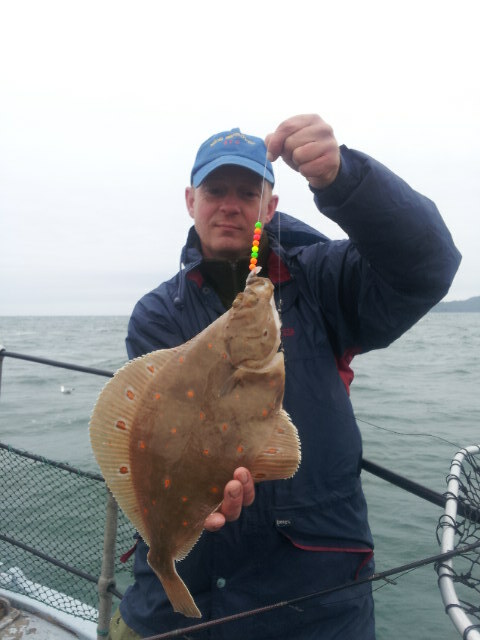 Eventually managed to find a couple of days to get out and have a look for a Plaice or two. 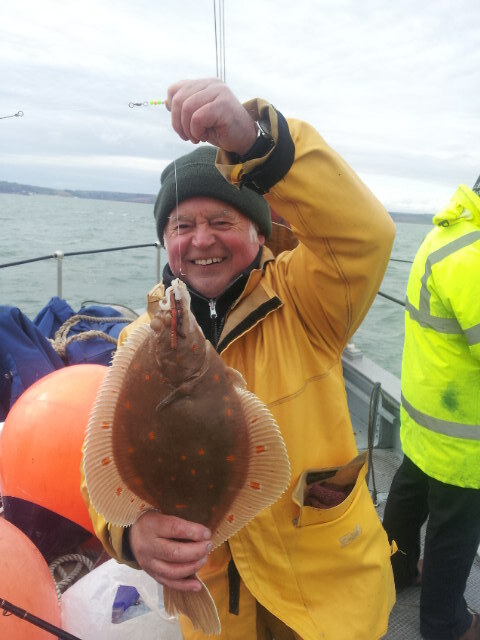 We have had all of our trips this year so far cancelled by bad weather, last year we were well under way with good fishing by the middle of February. 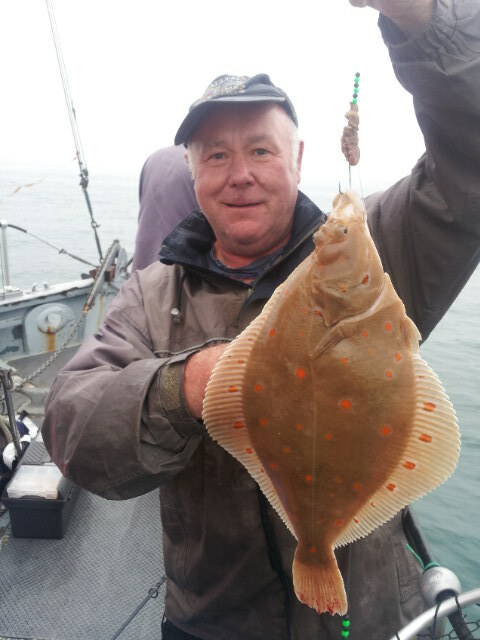 We were booked for the Fri/Sat/Sunday 8th/9th/10th, Friday we managed to find a total of 85 Plaice to just under 3 1/2 lb. 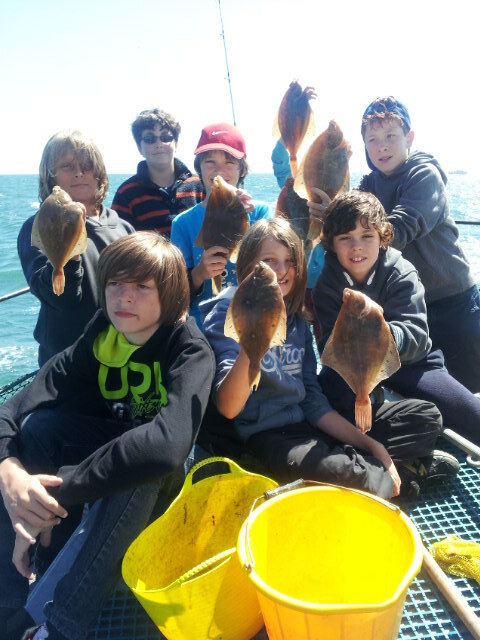 The Lads returned 46 of their Plaice, and although a lot of them were on the small side not all of them were. 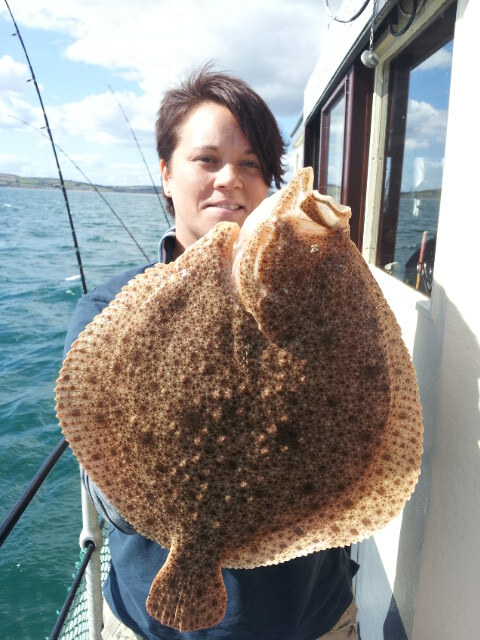 It's so nice to see anglers returning good fish when they have a few in the bag. 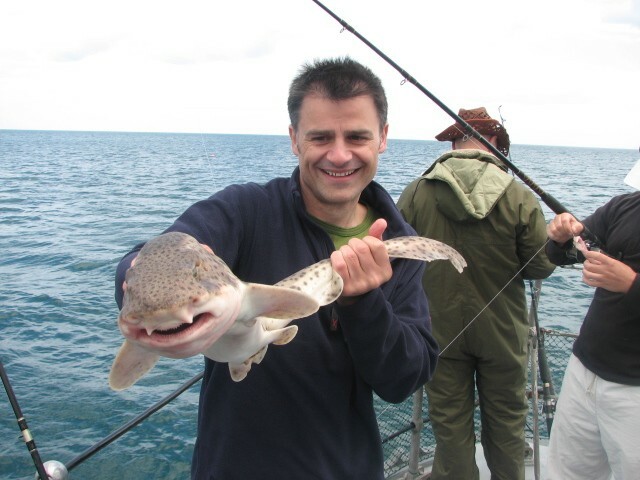 The Trawlers certainly would not be putting these fish back. 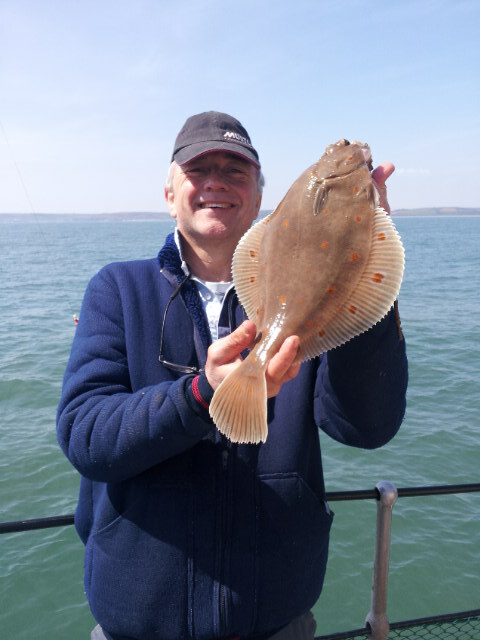 A Turbot of 4 1/2 lb (returned) and a nice Blond Ray of about 8lb (great fun on Plaice tackle) were the bonus fish on a very good day to start our season. 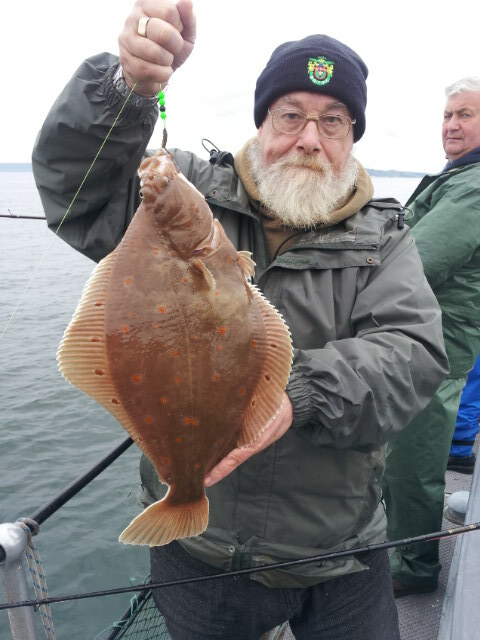 Saturday 9th saw 8 lads catch 68 (38 returned again with some good size fish going back) with the best at just over 4 1/2 lb and a lovely Dab just under 1lb. Considering 5 of the 8 were newbies to the game, they all done very well. 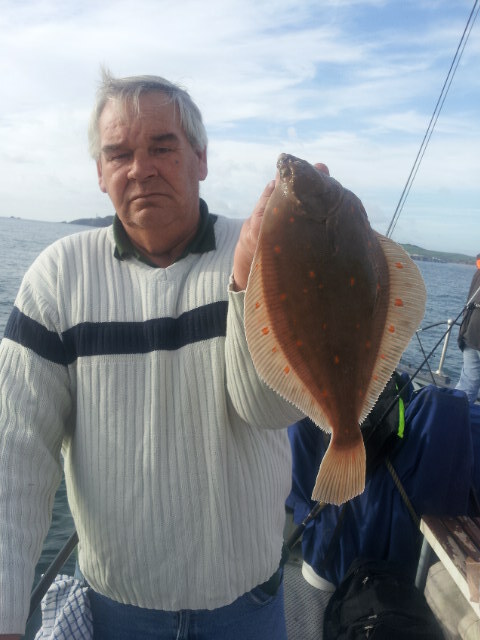 Sunday 10th, the second booking from the Blackspot fishing Club from Plymouth this year was again cancelled as the forecast threatened force 8/9 from the East. The rest of the week is looking absolutely cr*p as well, so after 2 decent days it's back to normal for us. Snow on Tuesday they reckon. Wave height in Start Bay Tuesday 11 th March.This is what Easterly Winds do to us. 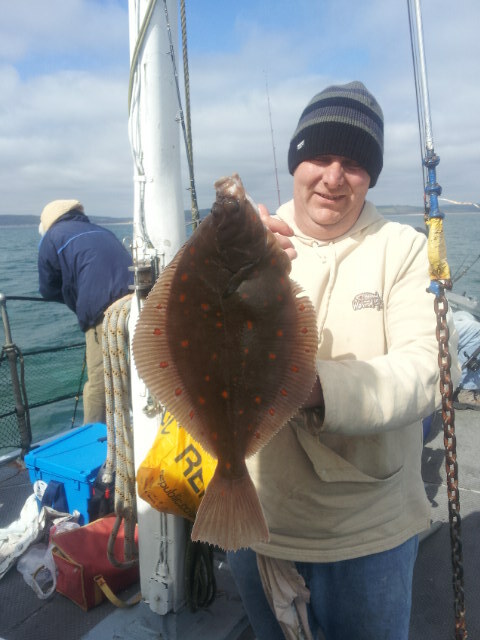 Sunday 17th March. 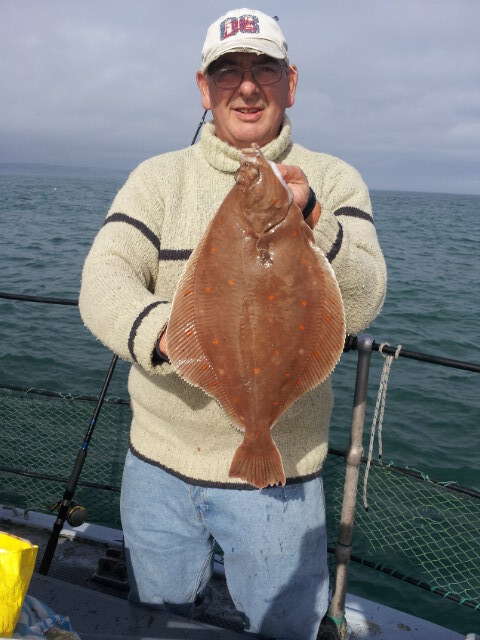 Lost Saturday to high Easterly winds again, this left Sunday a bit messy with dirty water over the Banks, so not conducive to good Plaice fishing. 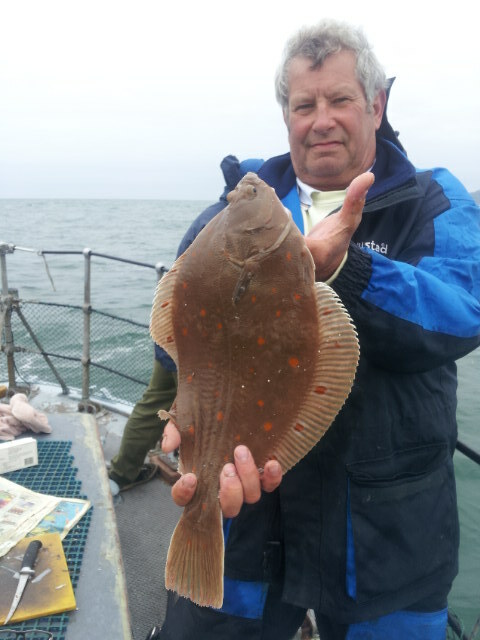 We fished with a group that were inexperienced when it comes to Plaice fishing, so a lot of effort went in for a total of just 25 Plaice. 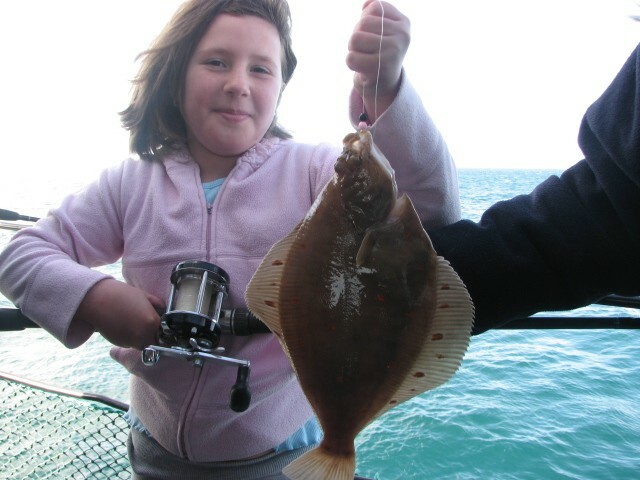 We also pulled up what appeared to be a Flounder (see 1st picture below) but this fish had no 'nodules' on the side of it's head, and all the way down it's lateral line it was like running your finger down a stiff bristle brush. 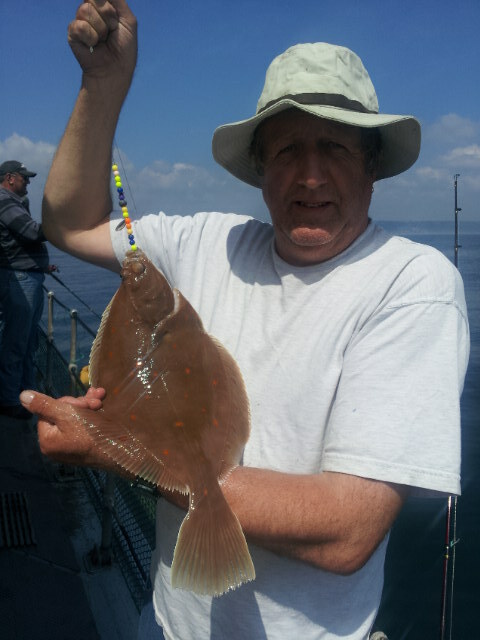 It was similar but 'different' to any Flounder i've caught in the past, but as we don't see many out here I could be mistaken. 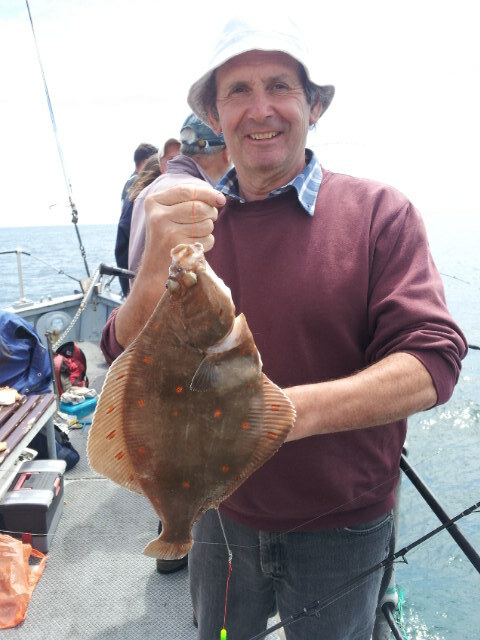 If anyone more experienced with Flounder could help identify if this is or isn't, please give me a call or email, thanks. 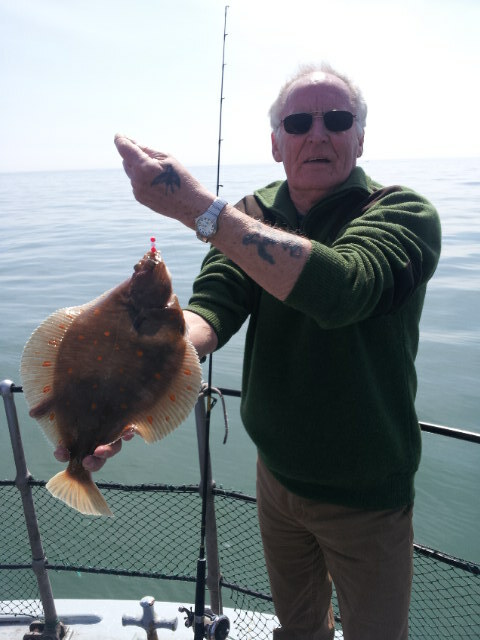 Tuesday 19th March. 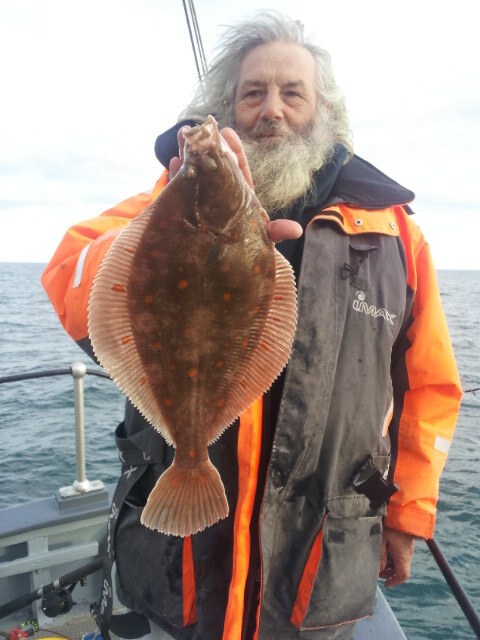 Decent days forecast so back out again with our regular crew. 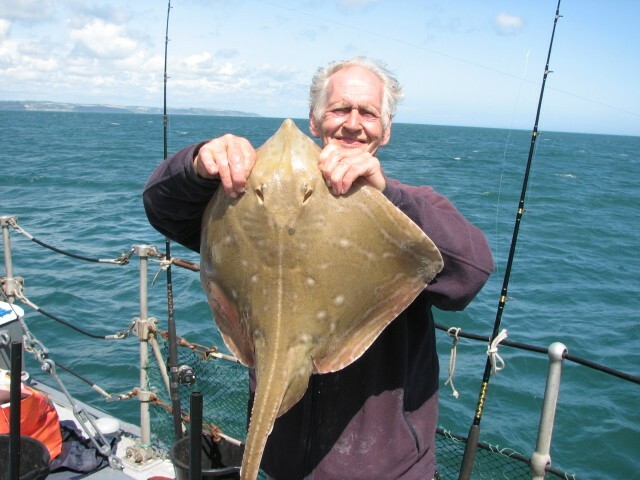 It makes all the difference when you have good anglers aboard, or I suppose I should say anglers experienced at Plaice fishing. 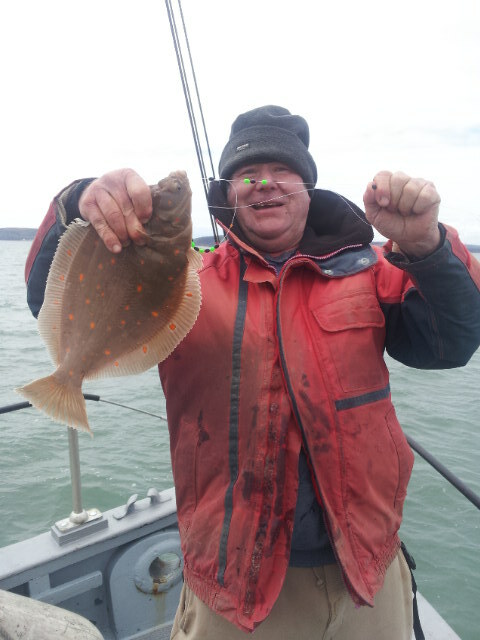 These Guys get consistently good numbers of Plaice when we venture out, week after week, even when the day before the fishing has produced very little. 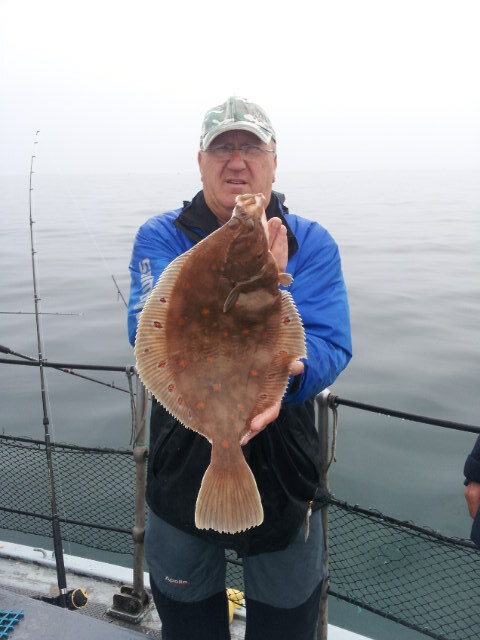 O. K. the weather was kinder, the water a bit cleaner than the trip before, but 106 Plaice between 9 anglers shows their caliber as competent anglers. 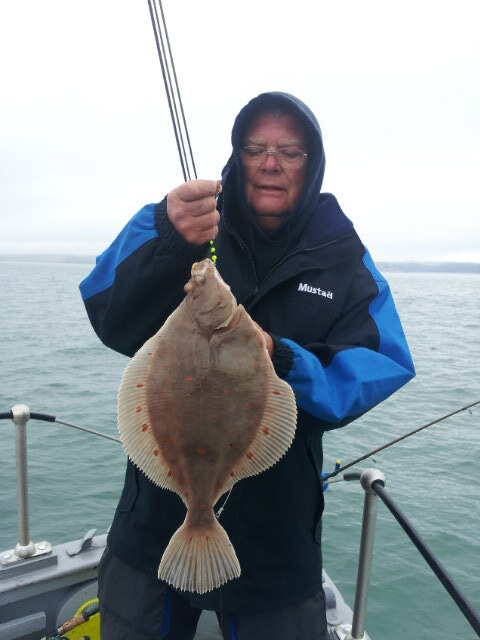 No big un's this trip but plenty of quality fish. 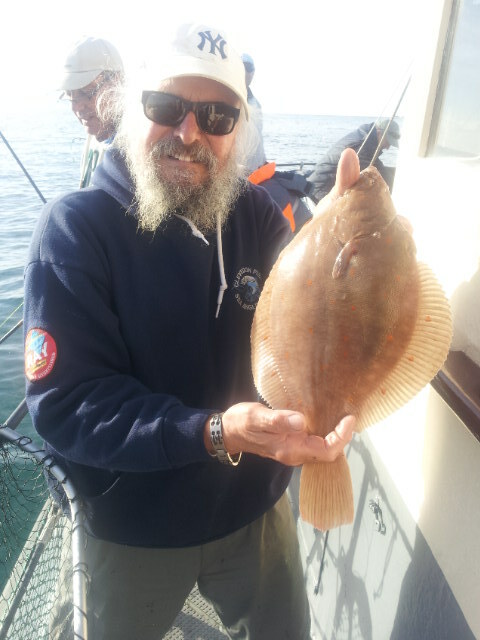 As always they were selective about what fish they took, with a lot being returned to hopefully grow on. April. How much longer can this crap weather go on? Been out 4 times since Christmas. 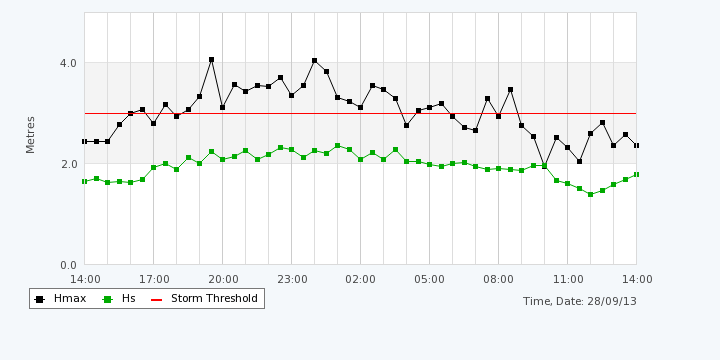 9 weeks of easterly winds. Sunday April 21st. 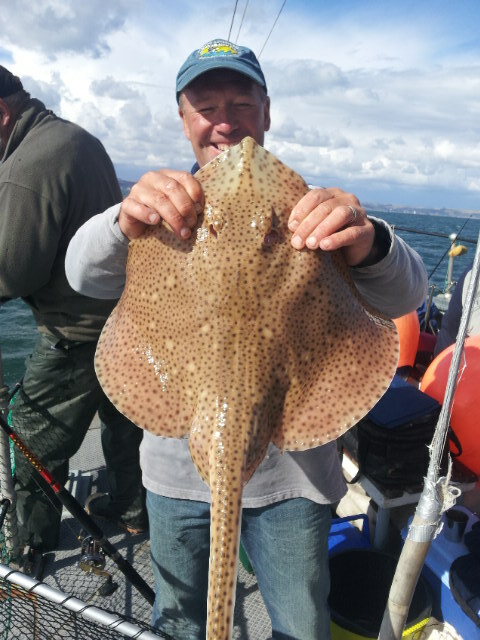 Had one of our regular crews out (Blackspot fishing Club) who really let us know if there are any decent numbers of Plaice on the grounds, they consistently get big catches because they are very experienced on the Plaice and are generally excellent anglers. 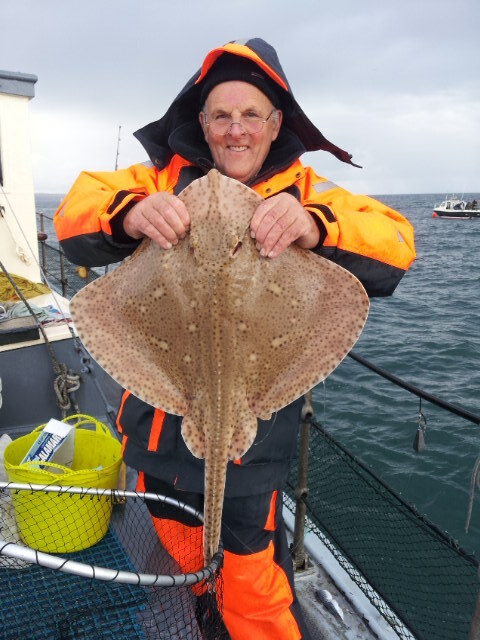 We ended the day with 62 Plaice of which they returned 19 (not only small ones were returned) a couple of Doggies and Whiting, and a few Sardines, a bonus Brown Crab for Gordon who seemed more excited by this than the Plaice he caught. 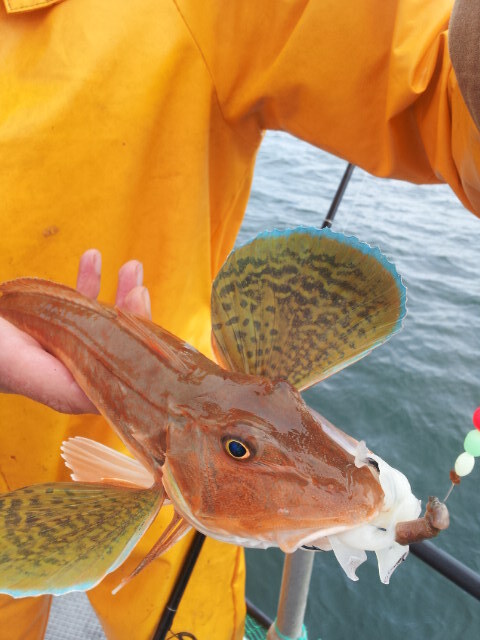 Still no sign of any Mackerel. 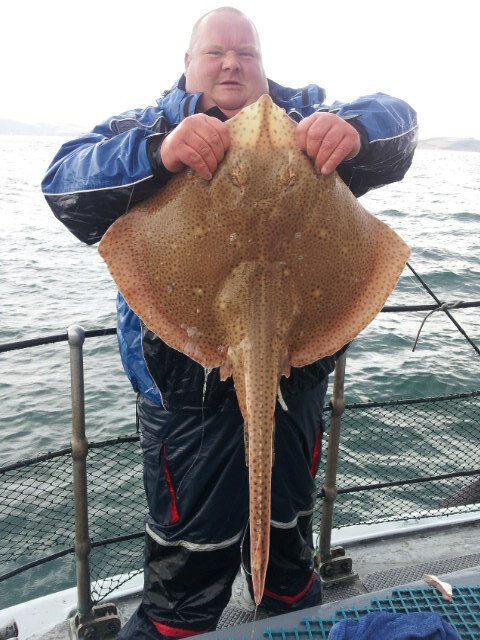 Rob from darkest Wales was a guest for the day, he sent me a link to an excellent report he posted on the WSF forum. 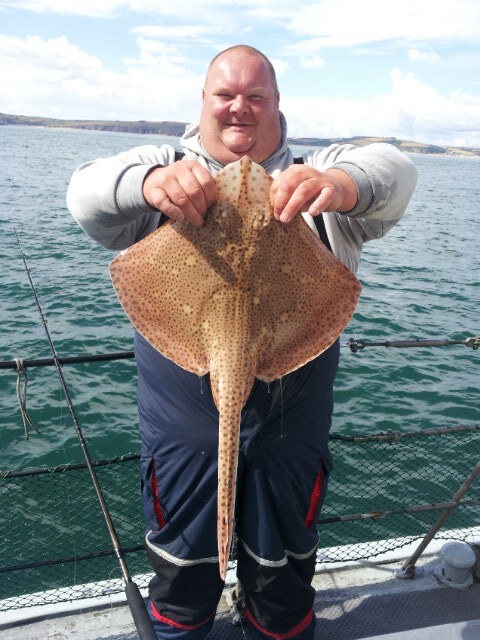 To read click: www.worldseafishing.com Thanks for the kind words Rob. 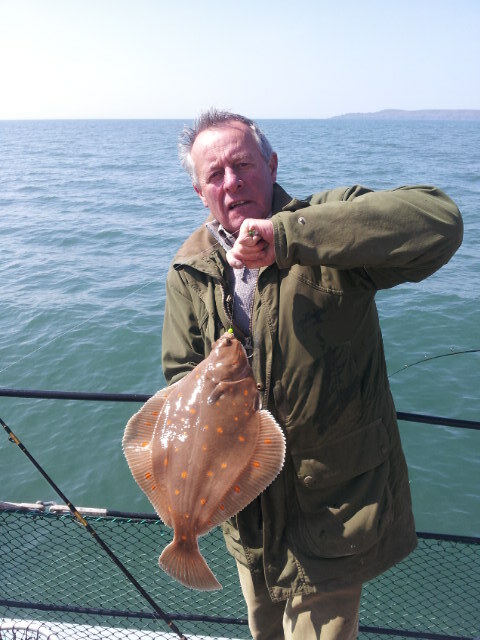 Wednesday 24th April Back to a windy day and the tides are getting a bit big for comfort now, only managed 56 plaice (20 returned) 16 Sardines (Pilchards) 5 Whiting 2 Doggies and the very first Mackerel of the season. 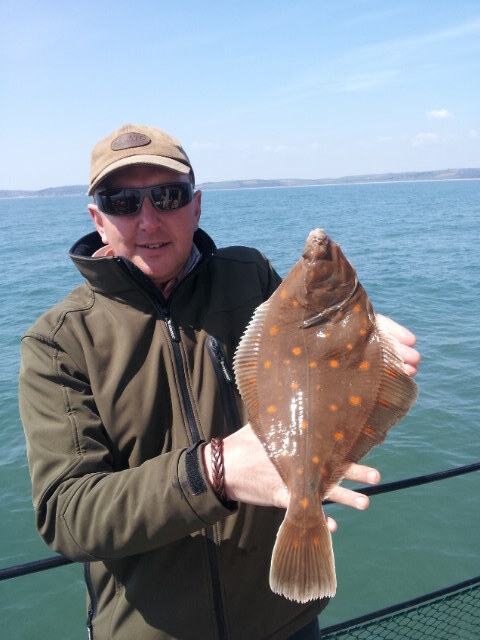 Looks like Saturday is blown of with the dreaded Easterly's again. 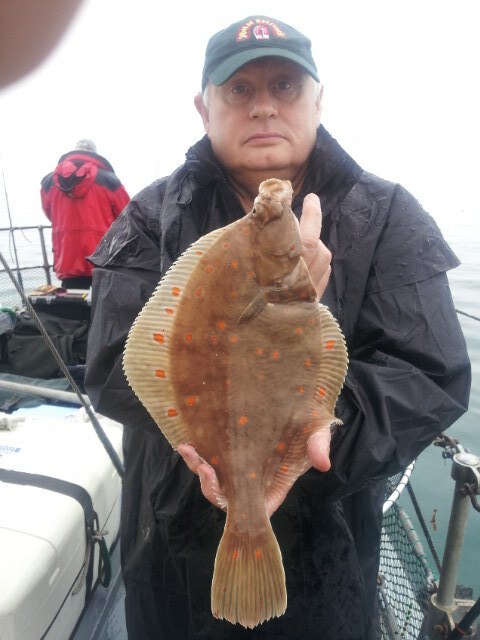 Saturday 27th was a no go, the Easterly's kicked in as predicted but died down by the early hours of Sunday 28th. 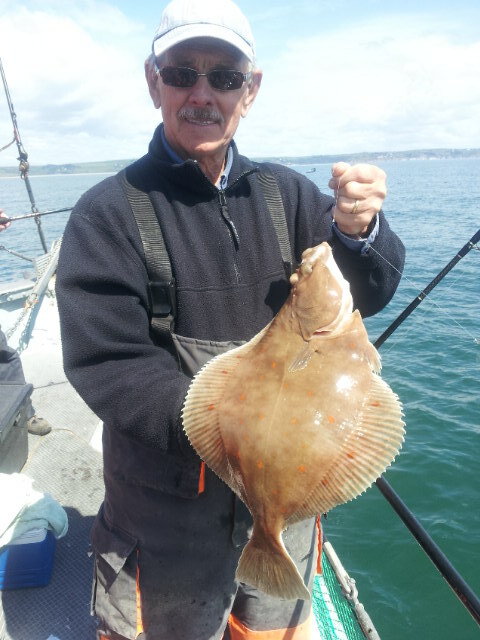 With a 5.2m tide and the stirring up the banks had on the Saturday I was not that hopeful of good fishing, the Plymouth Kingfisher SAC lads were waiting sharp at 8am on the Quay and we headed out into a reasonably flat Bay with just a small easterly swell left from the previous day. 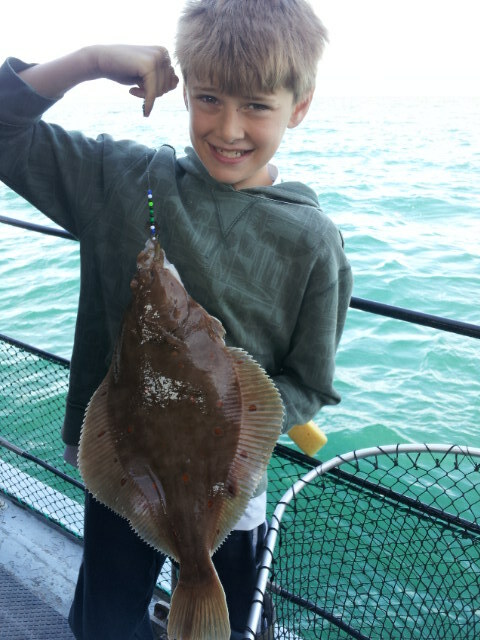 The tide was running pretty hard still and the fishing was hard also. 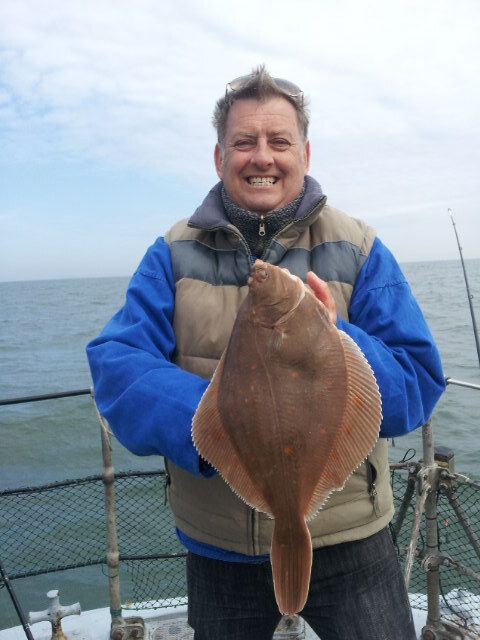 After an hour without a fish the tide slowly eased and the fish started to bite. 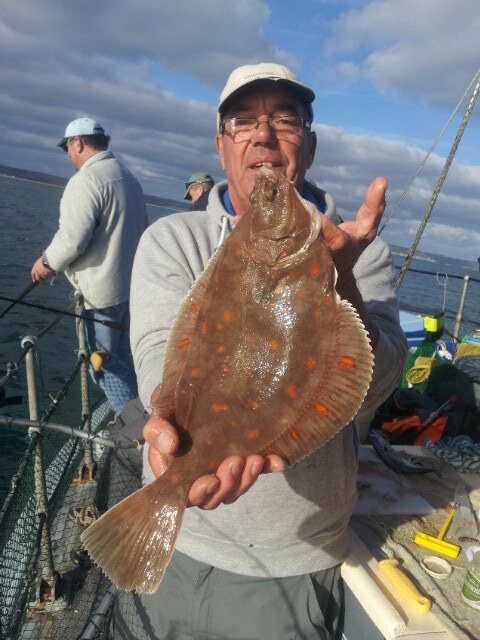 All through slack water and into the ebb we picked up Plaice at regular intervals, nothing huge, plenty of small fish but enough good ones to keep everyone on their toes. We finished our day at 4.20pm with the wind starting to blow pretty hard from the S.W. 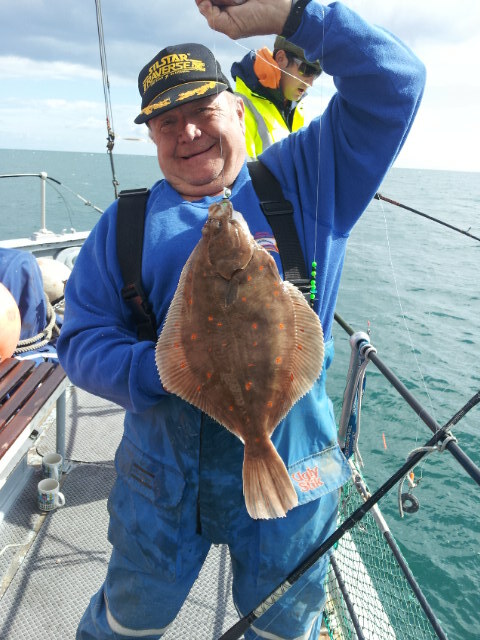 the final tally for the day was 64 Plaice (20 returned), and some Whiting, with a few of them a reasonable size, so it look's like the Spring run may be on its way at last. 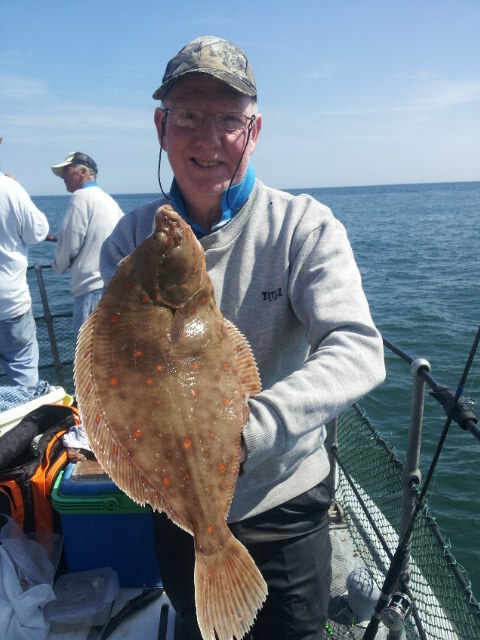 May 2nd, 3rd, 4th, 5th,6th, 7th Well what a week that was, Fishing continues to be excellent when the weather allows us to get out. 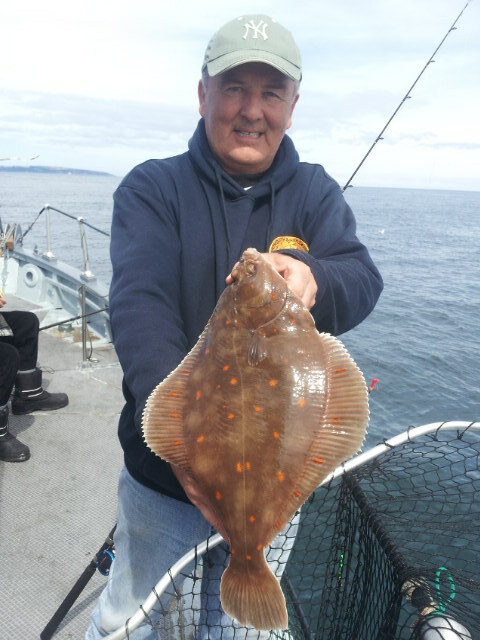 From the 2nd to the 7th on consecutive days we managed 79, 54, 61, 123, 89 and 67 Plaice. 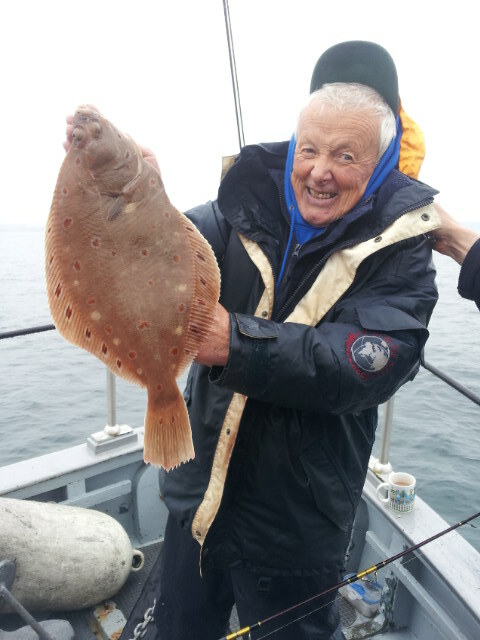 Normally around a third of these fish are returned. 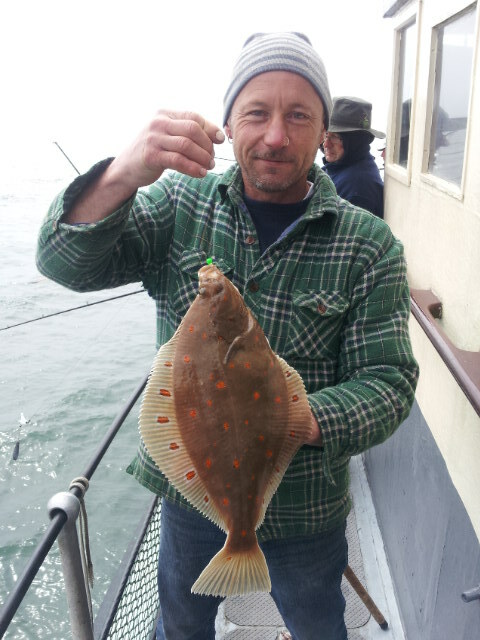 A few pics of some of the better Plaice. A few days off through bad weather again. 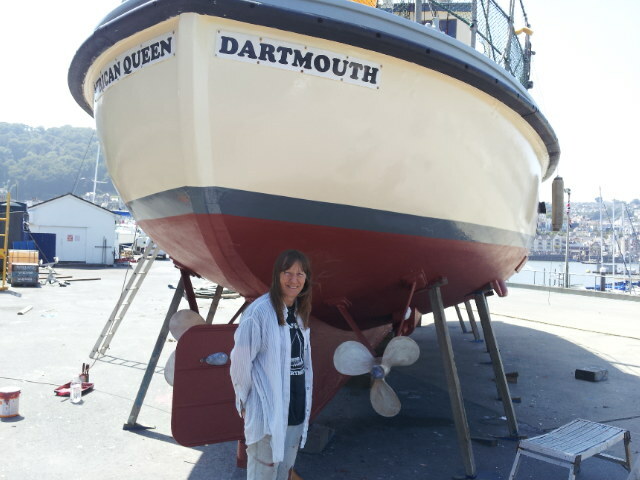 Getting on with some painting on the Boat when the days are dry enough. 13th May just starting to scrape the deck to get a much needed coat of paint down when I start to feel unwell, I hadn't felt 100% for a while but just put it down to over doing it during the Chalet refurbishment, I had not had a day off since Christmas. 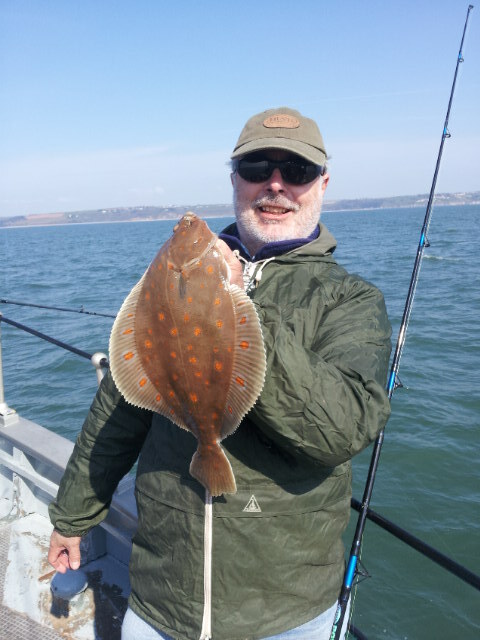 Phoned Doctor, Tuesday A&E in Torbay, Tuesday night cardiac ward, Wednesday 4 stents fitted, Thursday home with a bucket of pills and orders to take it easy for a while. Heart attacks have a habit of creeping up on you, even when you have been encouraging them for the past 40-50 years. So no more fags, butter, chips, etc etc. 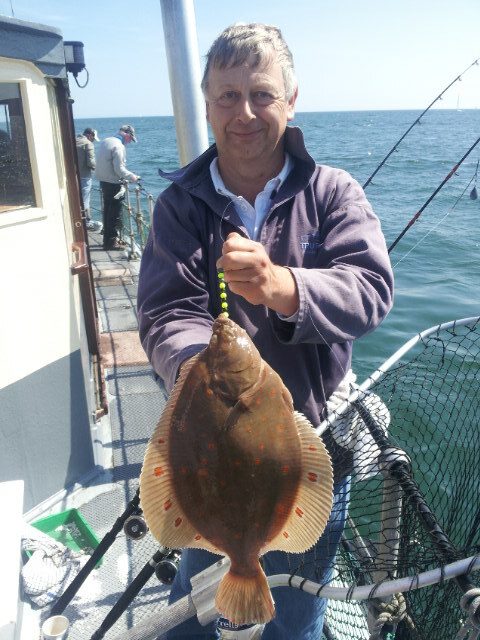 The rest of May was a bit of a disaster weather wise, we only managed 4 more days out with the hassle of me not having a license to run the boat and the weather (the MCA suspend your Boatman's Licence for 3 Months after a heart attack) Fishing still good with days of 79, 64, 50 and 42 Plaice recorded. June 2nd/3rd. 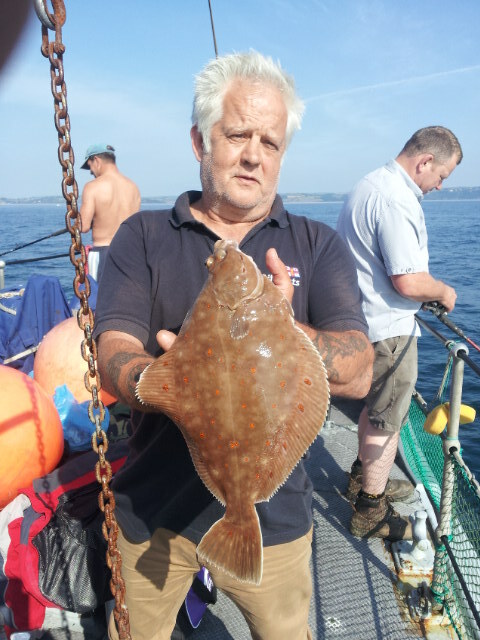 53 and 103 Plaice on board, loads of Whiting, Gurnard, Dabs and as many Mackerel as people want, 6 trips cancelled until the 10th when we managed 85 plus all the bits. 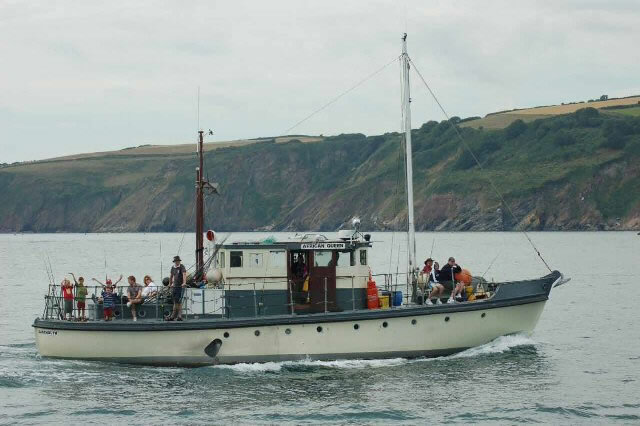 Hilary has now got her own Boatman's licence commercially endorsed as it is known, so is now officially Skipper of the African Queen, thank goodness she took her test all them years ago, me, I am relegated to crew (no difference really) 9 booked days cancelled with horrible Easterly winds, out on the 18th 19th, 20th and 21st 77, 107, 67 and 54 were the returns. 29th, 30th. 42 and 31. 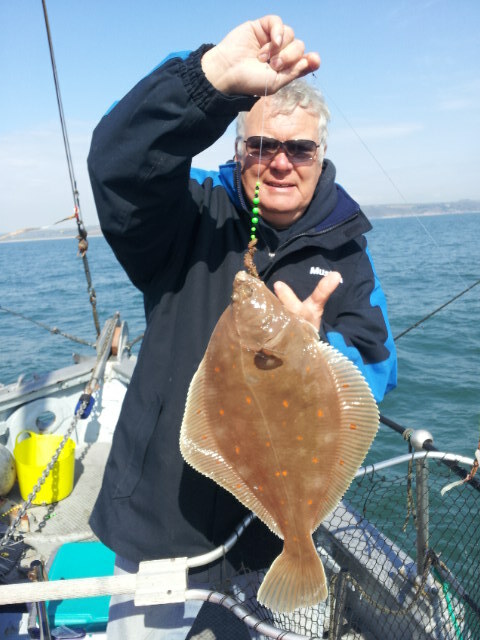 So only 9 days fishing out of a possible 30 this month, don't you just love Easterly winds. 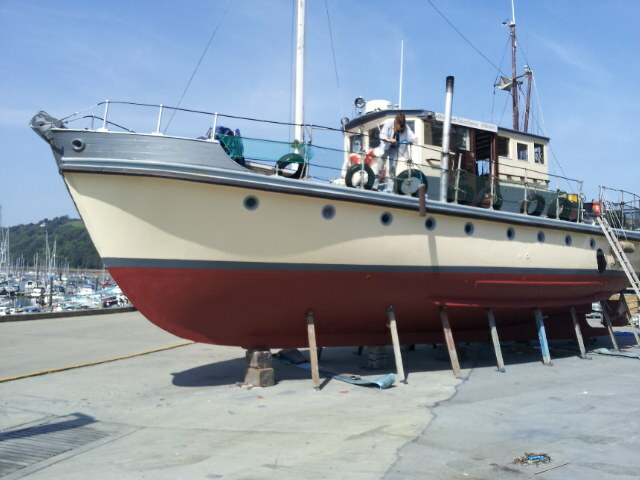 July 8th to 12th, Took advantage of another week of easterly winds to get the Boat out again for our annual anti foul and paint up, only 5 days for me and Hilary to prepare and paint a 50 foot Boat, including any repairs needed to the hull and stern gear. I think I'm getting too old for this game. 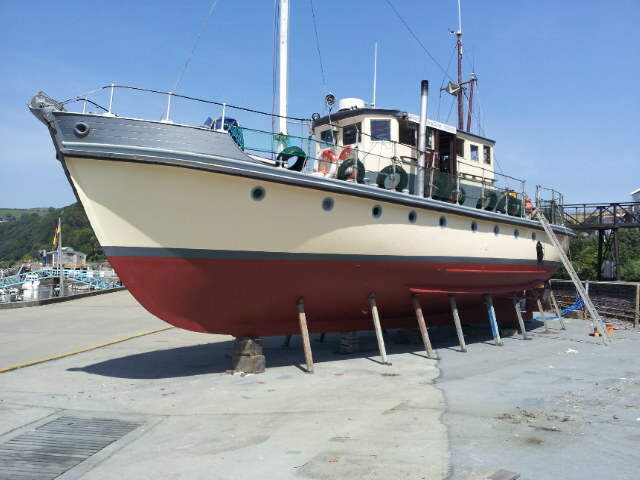 Really it's only 4 days as we are not 'chocked' up un till dinner time on the Monday, and then we have to be ready to go back in the water (paint dry) on the Friday afternoon. A lot of work for us both. Thursday 11th, dropped one of our propellers on my big toe (had crocs on) f*****g ouch, it wouldn't have been so bad but I'd just paid £90 each plus vat to get them polished and balanced. Anyone want to buy a Charter Boat? 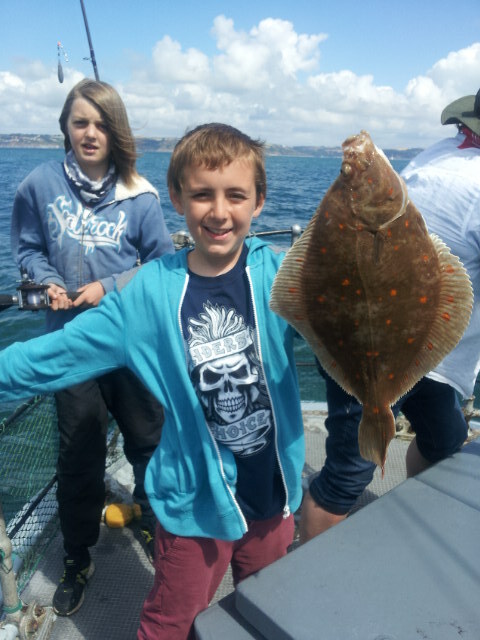 July, getting into the holiday season now, school kids from South Devon College for 4 days again, some nice fish caught and a lot of fun for everybody. 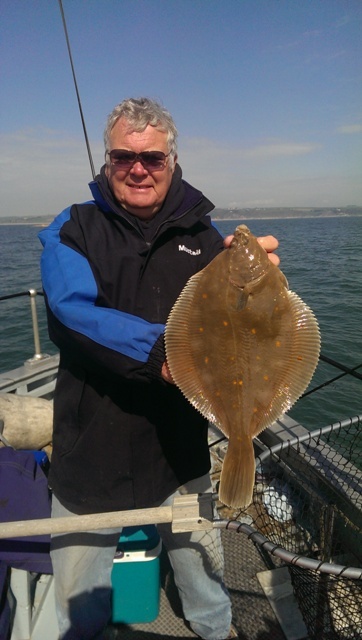 When we are able to get out with our regular anglers we are still finding reasonable numbers of flatties, we have had days between a low of 37 and a high of 68, so still good fishing for July. 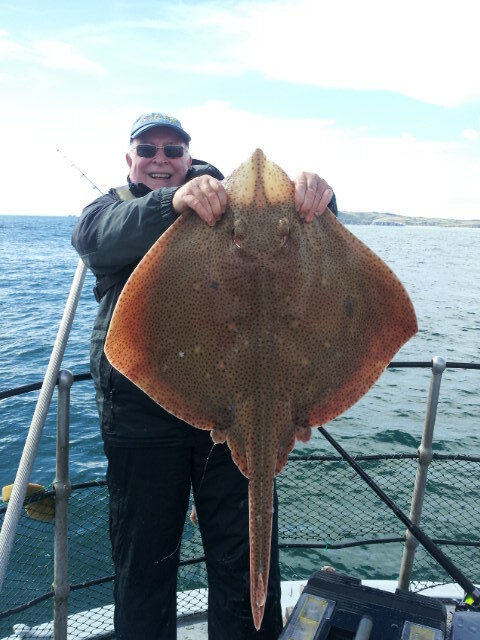 We have had all our Ray trips cancelled through bad weather this year so not a lot to report on that front, apart from when we put the anchor down for an hour at the end of a day's Plaice fishing to have a look at one of our old Ray marks that we had not fished for a while, we caught 3 in double quick time, best Blond and first one up 21lb 12oz. 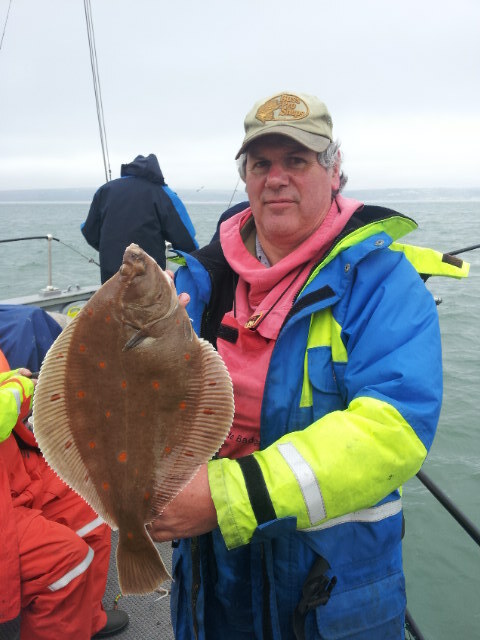 There does not seem to be the same amount of fish on the ground as we found last year (according to the other Boats that have had a go) but there has been a lot of commercial pressure on them this season. 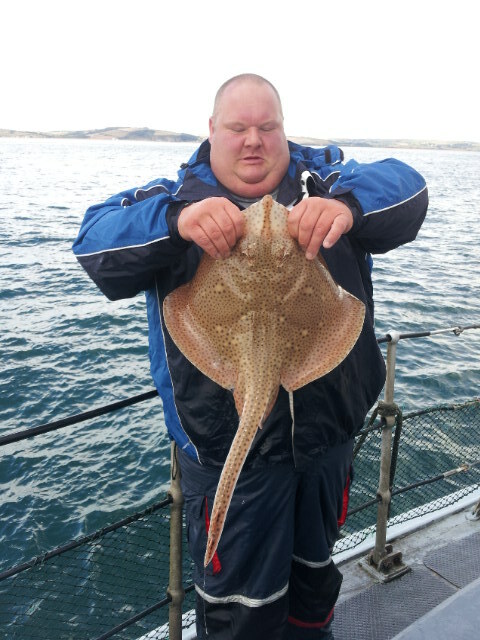 I heard they were getting £5.30p a kilo in the market for Ray earlier this year. 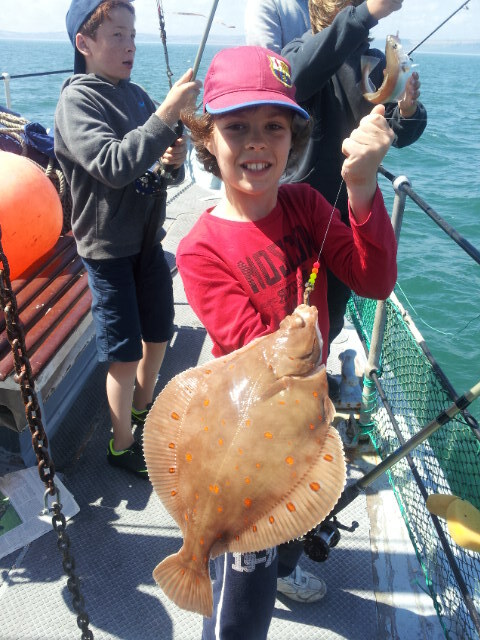 August, getting into the school holidays now with our normal mad run of half days with eager kids and parents itching to catch a few fish when the weather is fit. A lot of work, but it is what pays the bills. 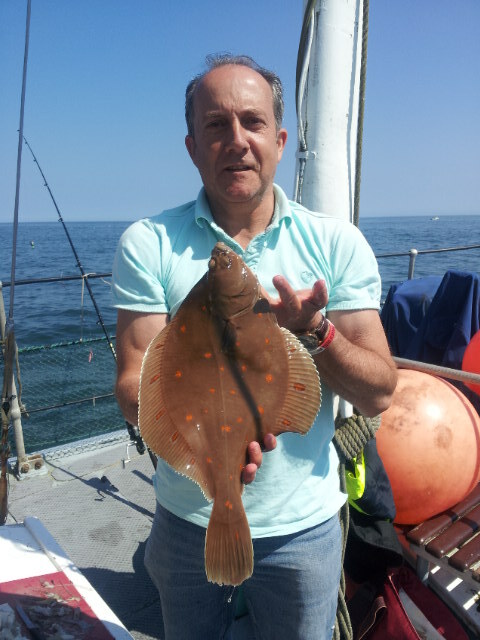 We get the odd 'proper' trip out between the holidaymaker's when we can relax a bit and try for a few decent fish rather than the Whiting and Mackerel. 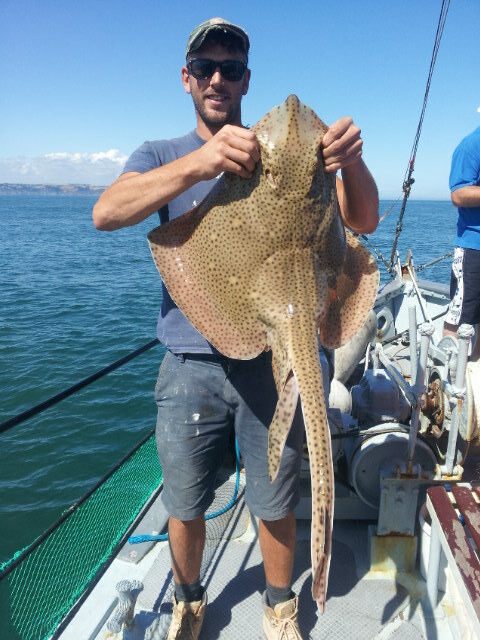 8th August see us out with one of our regular crews who bagged 45 Plaice, a couple of nice Dabs and the ever present Gurnards, etc. 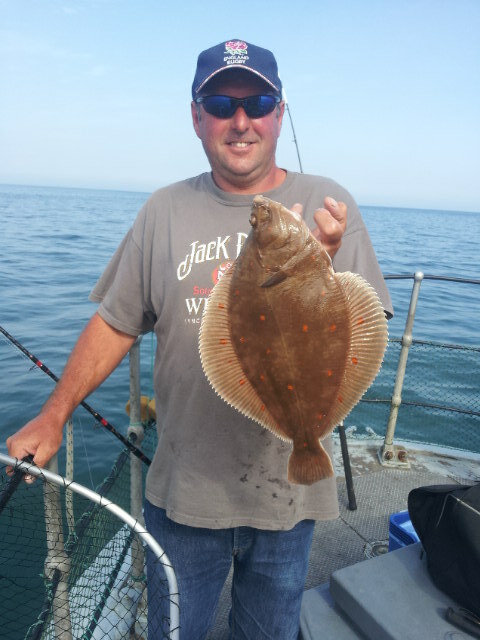 A couple of note worthy days were the 16th August with 68 Plaice and 2 Dabs. 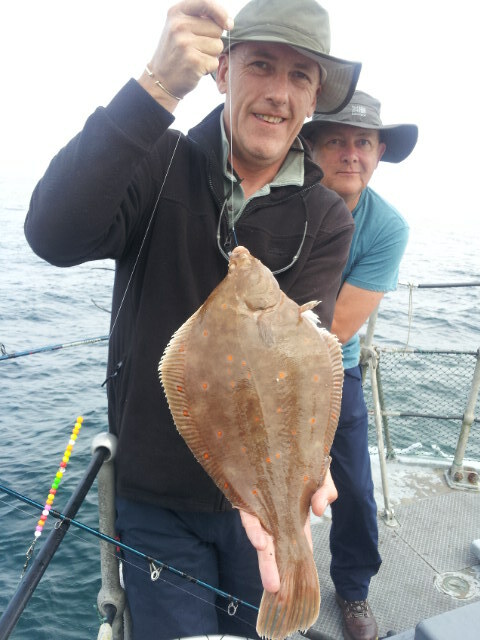 26th August saw 74 to just under 3lb and a couple of bonus Rays on Plaice gear to add to the excitement. 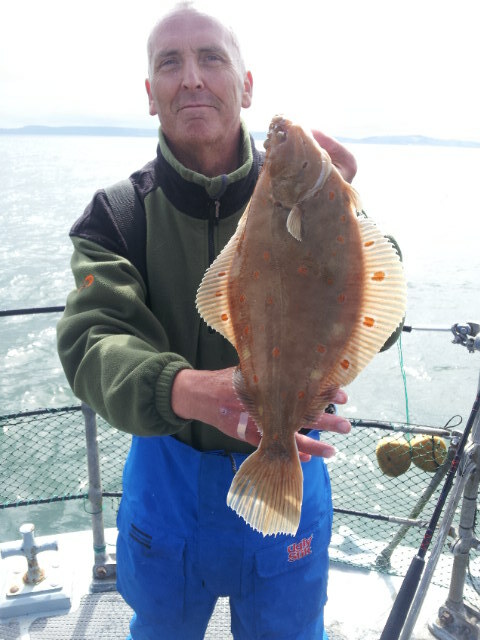 No sight of any Turbot, we normally snag one or two through August. September 5th. 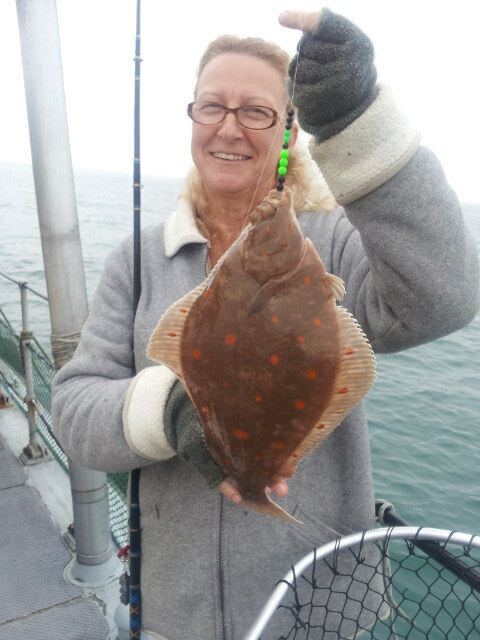 42 Plaice for a mixed group of 'proper' anglers who were on holiday at the same time. 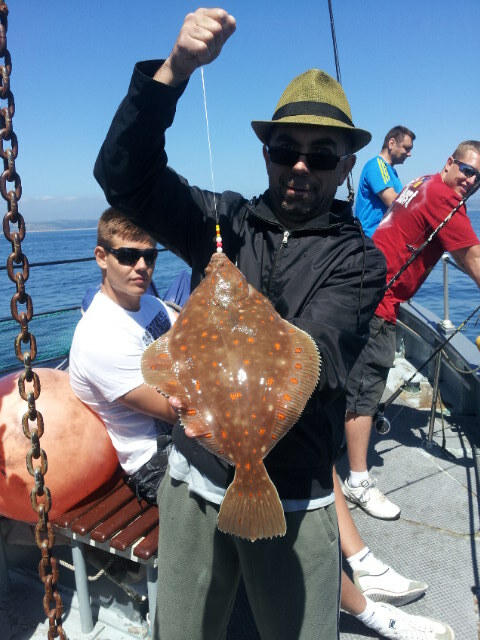 Competent anglers will always be able to catch Plaice with us. 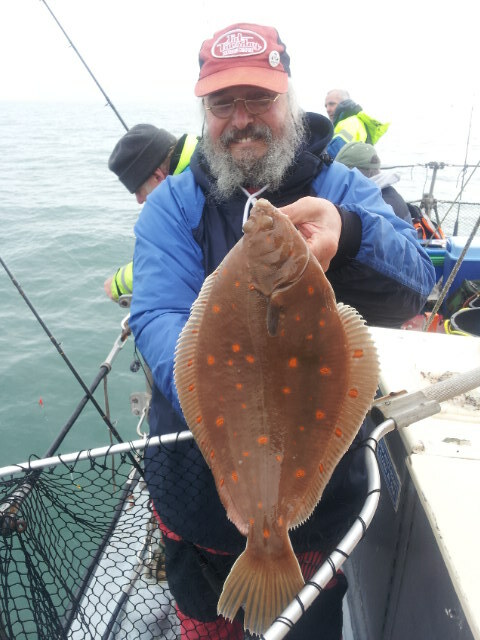 It is very difficult to teach non anglers the skills they need to catch a Plaice in a day, other fish, no problem, but Plaice do need a skill set that is not easily obtained. Saturday Sept 7th. 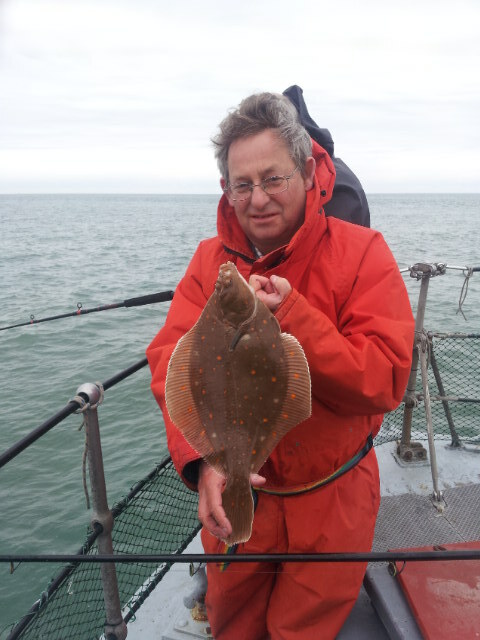 Our first dedicated Ray trip of the year, we have caught a few when drifting for Plaice, but we have not anchored a whole tide for them this year as every Ray trip we have had booked has been blown off until today. 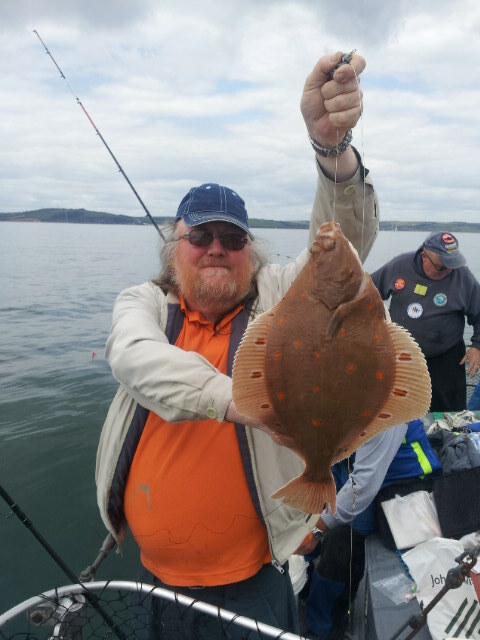 End result, 20 Blonds to 24lb 8oz and 6 very pleased anglers from the Holsworthy fishing club. 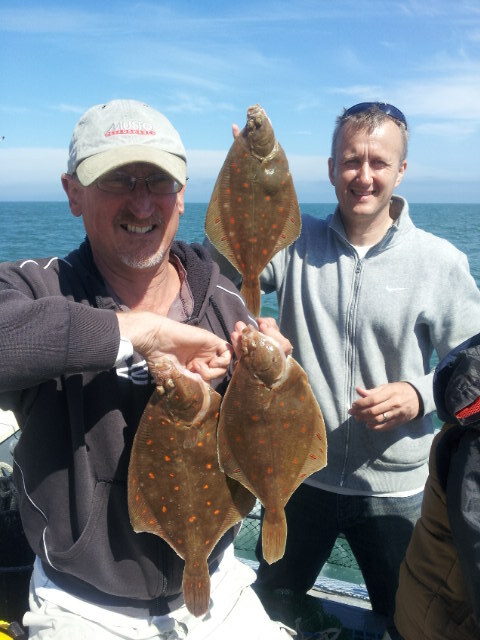 Had a group of Anglers from Bristol staying with us for 4 days, Tuesday 10th.we fished the Skerries and ended up with 28 Plaice plus all the bits and bobs on what was a fairly hard day's fishing. 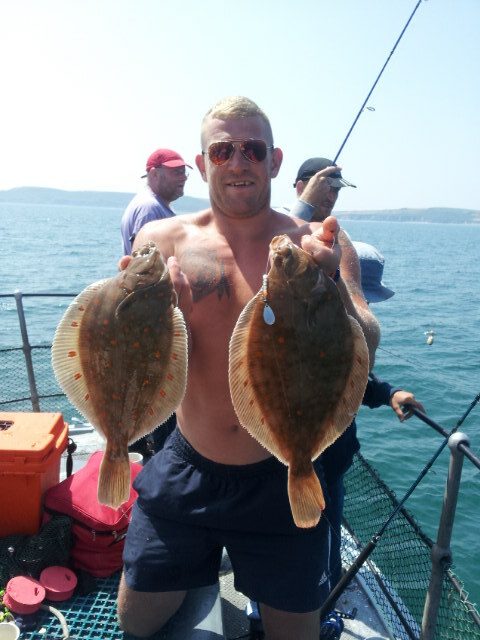 Wednesday 11th, went out on the wrecks, absolute disaster, 2 decent Pollack and a load of Pout for miles of steaming. 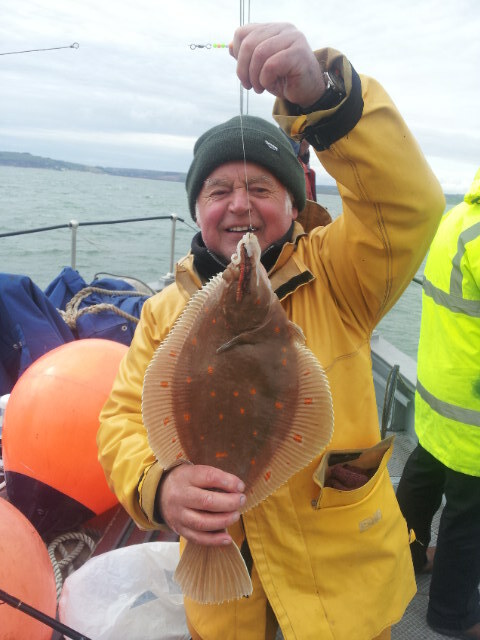 Thursday 12th we chose to fish for Ray and after our 20 day last week, all were really looking forward to it. 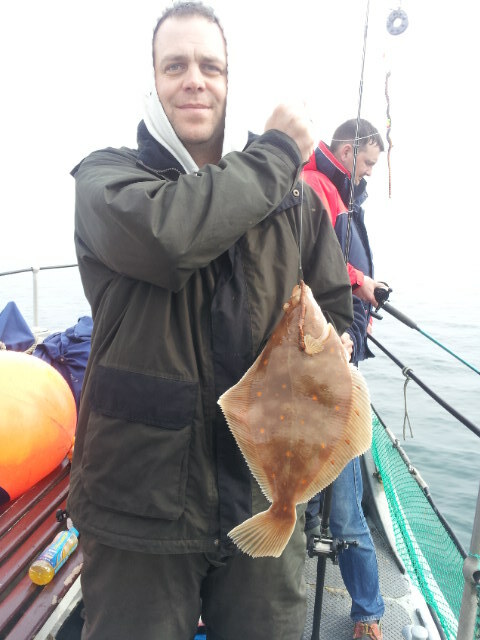 Disaster, 1 small Ray for the whole tide. 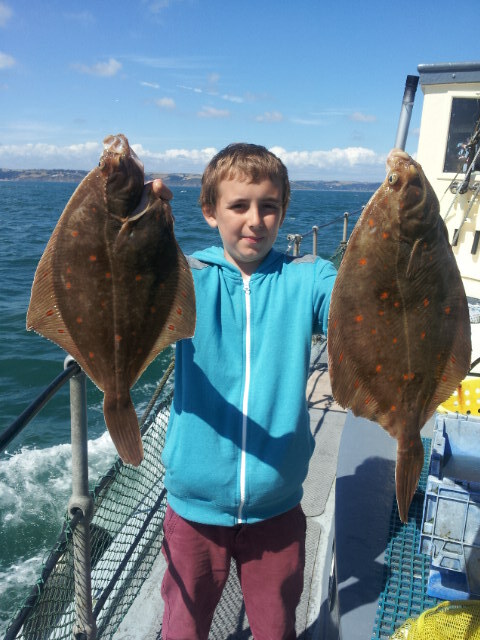 Friday 13th, after 2 of them going home early we decided to fish the Banks for Plaice again and did manage to find 18, but not our best effort. Sorry Lads, I tried my best, honest. 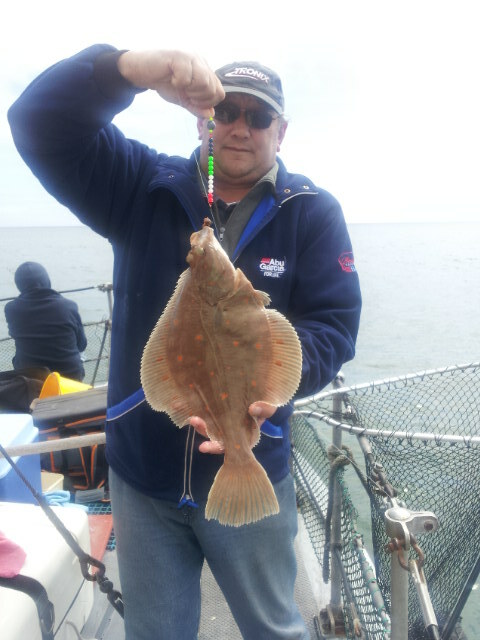 Saturday 14th September, another group from Bristol and half of them beginners. 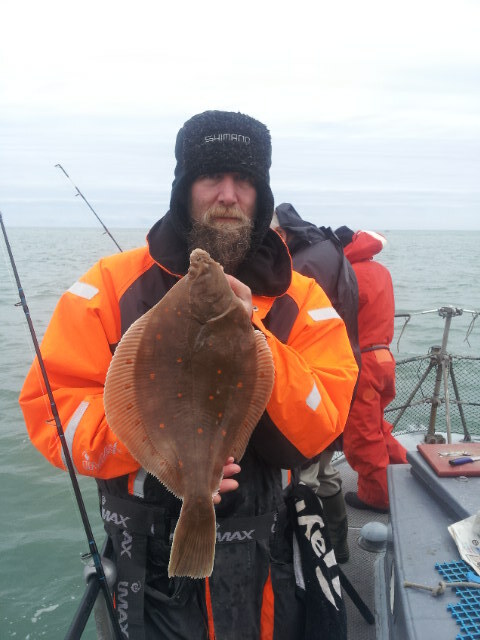 We started to drift the Banks in much better conditions than we had seen for the previous 4 days, a fairly quite morning with a few fish coming to the net was the order of the day as everyone found their sea legs and got used to fishing the way we do for Plaice. 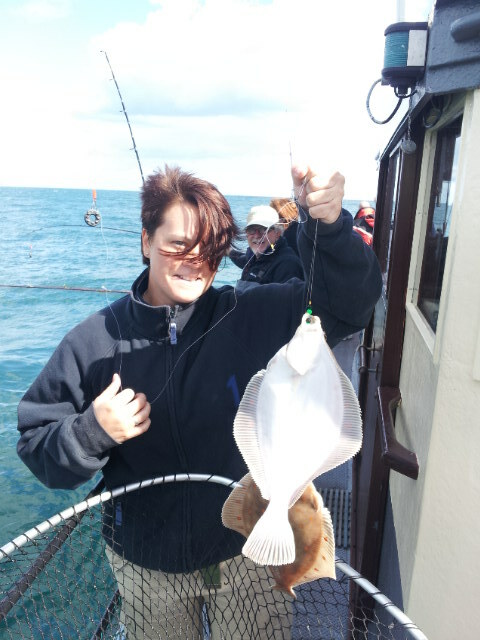 As the tide turned the fishing got better and better with everyone managing to catch fish. 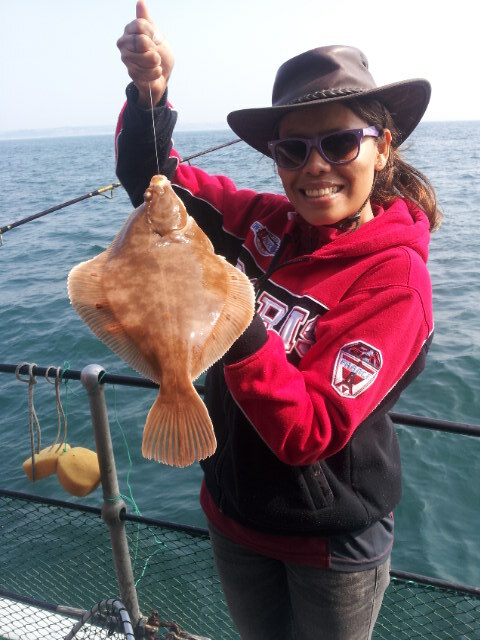 One young lady, Carrie, was equal top rod on the Plaice with Her 9 fish, and she also caught a good bonus Turbot which caused a certain amount of envy among the Men. 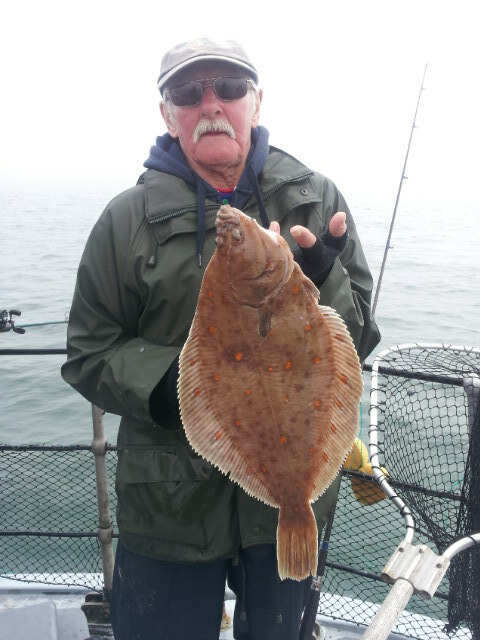 Total Plaice boated on the day was 60, best fish 3lb 4oz to Dave Duck. 14th-21st September. 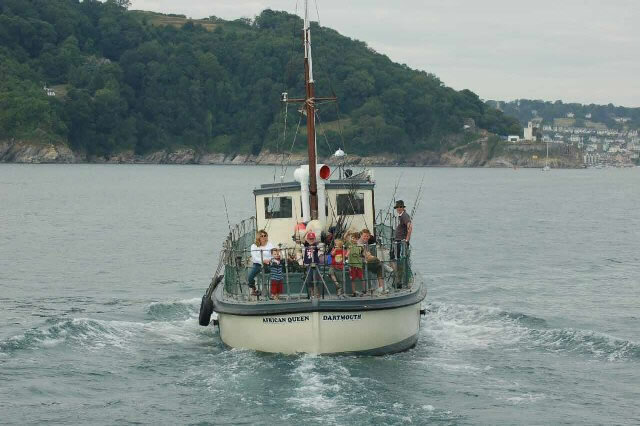 Bi annual visit from the Brighton Boys this week, they arrived on Saturday 14th and shared a good day with the Bristol mob as per the report above. 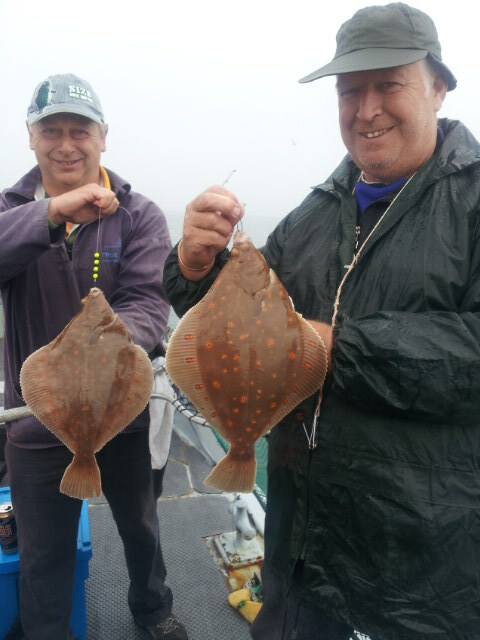 They should have been fishing every day with us until Saturday 21st, (7 Days) but because the weather turned poor on Sunday, and there was no prospect of any respite till the next weekend, they all went home on Wednesday to protect their livers from the boredom of 3 solid days in the pub. You can have too much of a good thing. Look forward to seeing you all again in the Spring Lads. Saturday 21st. 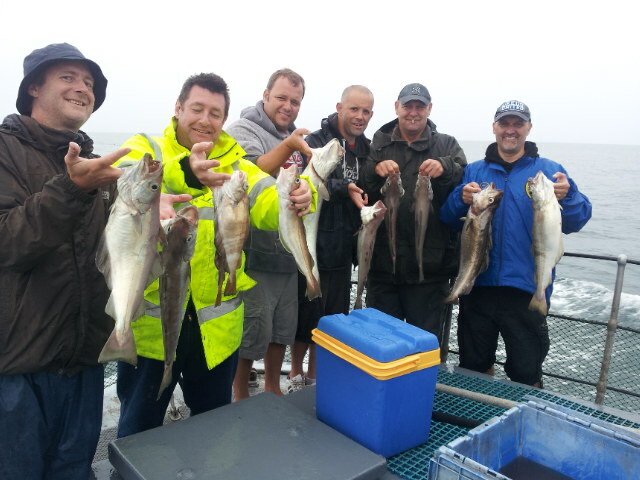 Well the boys missed out big time today, first time we have managed to get out since last Saturday on what should have been the Brighton boys last day. 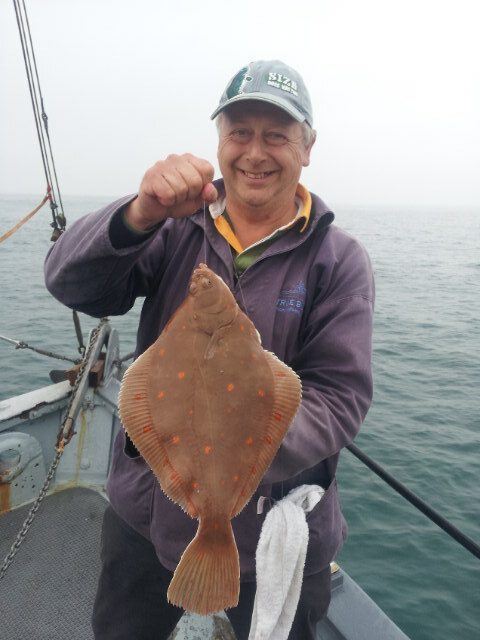 We found some nice Plaice and finished the day with 65 and 5 good Dabs, best Plaice over 3lb and 3 of the Dabs over 1lb. 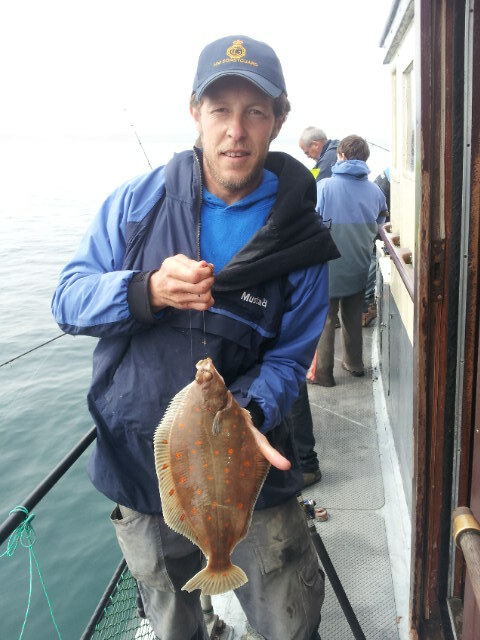 25th September, The kingfisher fishing club graced us with their presence today. 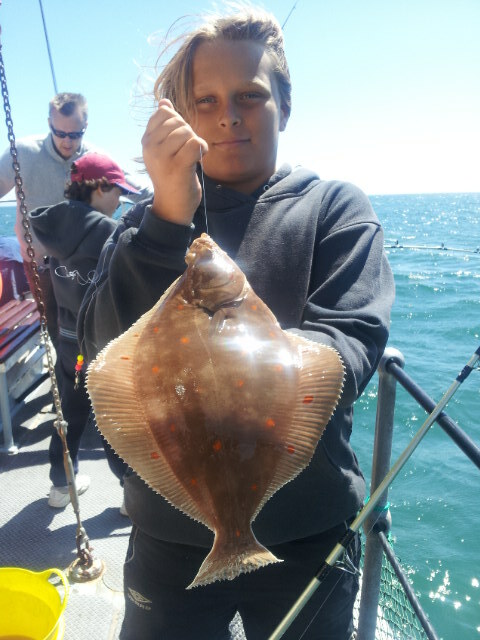 Warm air, flat seas and 86 fat Autumn Plaice to share out amongst themselves. 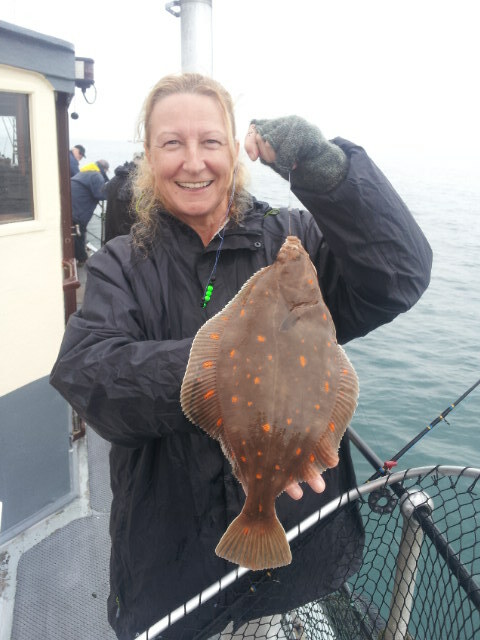 Another Lady angler, Lorna came fishing with the group and on the day she caught 11 Plaice, equal top rod in her club, well done Lorna. 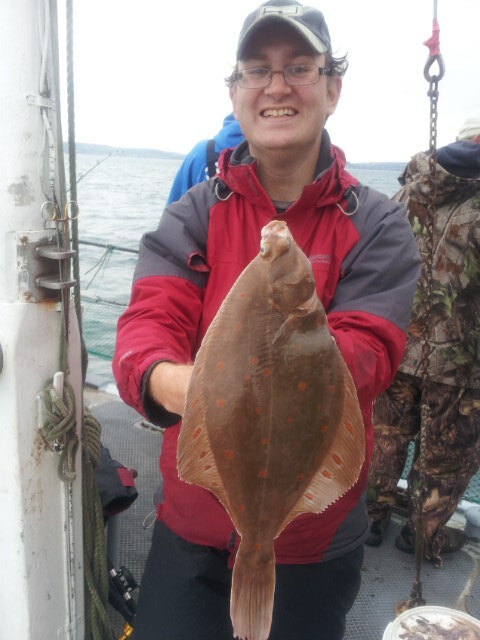 Best fish again just over 3lb, (excluding the Blond Ray that Tony 'accidentally' caught while drifting for Plaice.) 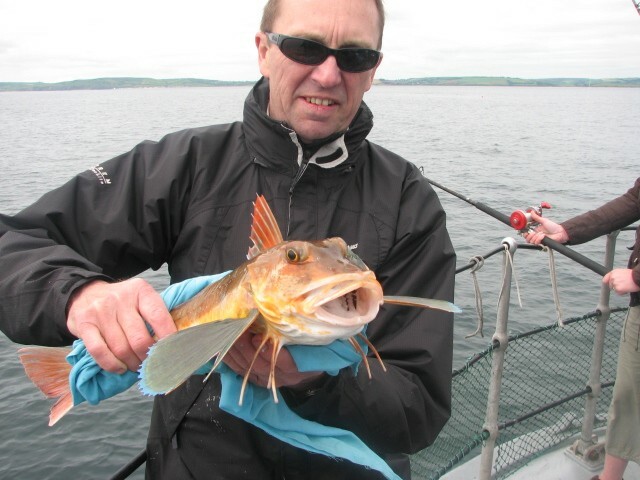 Plenty of Gurnard and Mackerel still about. 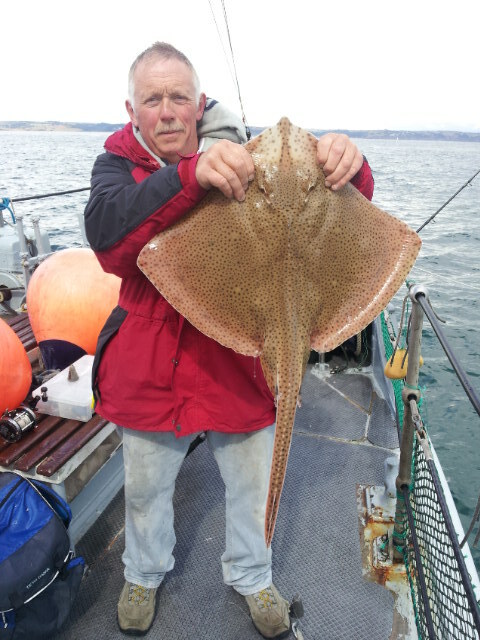 Another one of these wave buoy recordings for Start Bay. 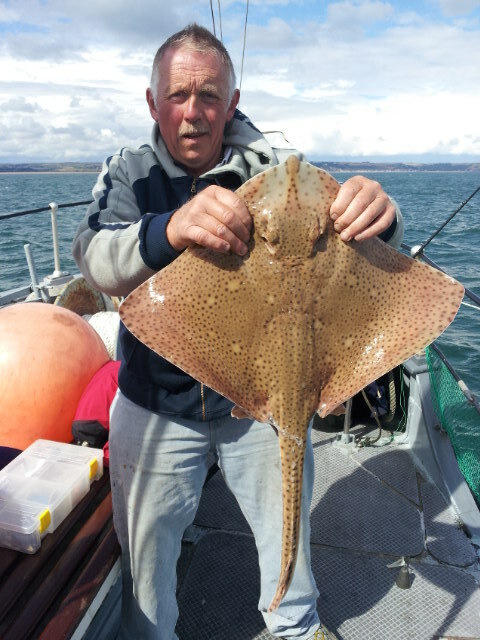 Remember the data comes from a buoy that is only about half a mile off Slapton Sands. 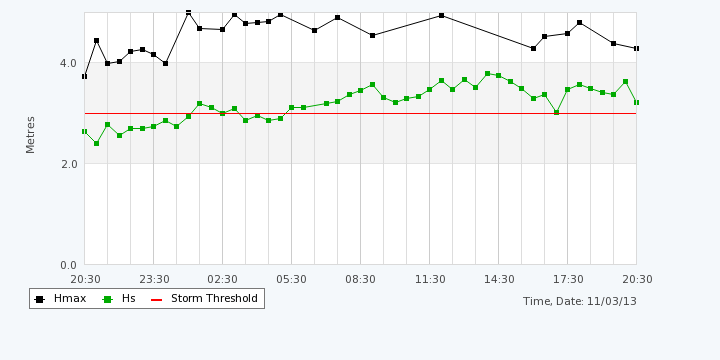 The red line is 3 metres, the green line is the average wave height, the black line is the peaks. No fishing today. 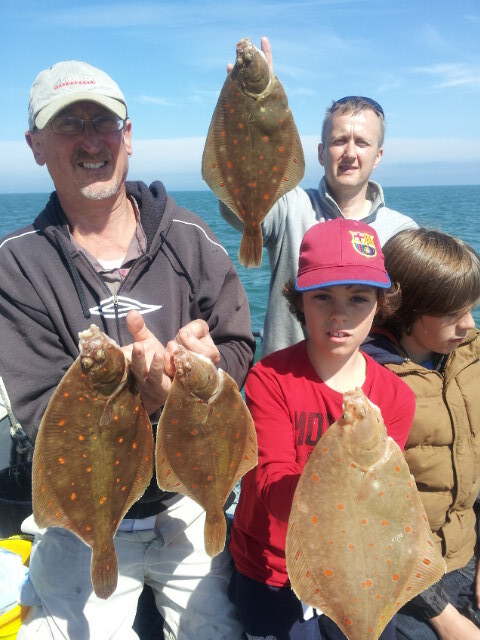 October, We lost half a dozen trips on the trot at the back end of September and early October, this was going to be our last run of good bookings before winter. 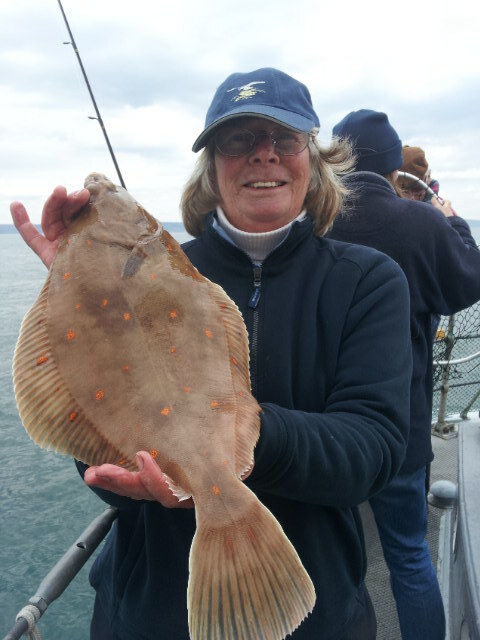 We have enjoyed some very good fishing and we had lots of keen anglers looking forward to having their day. Mr Easterly had other ideas and put us to sit day after day. 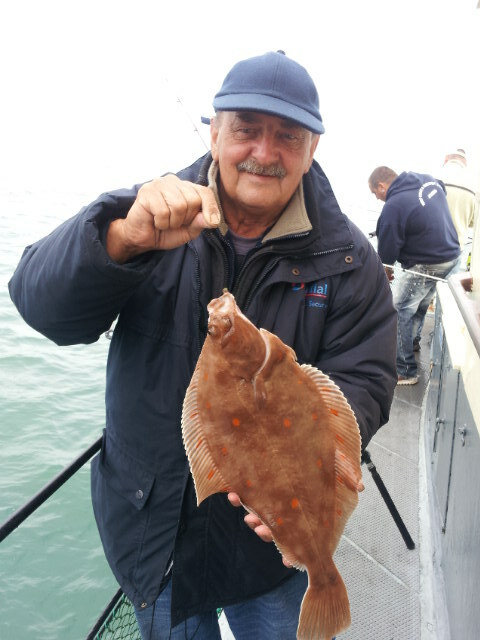 October 9th we managed to find a reasonable days weather and found a few anglers to make up a trip at short notice, we ended the day with 46 Plaice with 8 returned, lots of plump fish with plenty over 2lb, still plenty of Gurnard, Whiting and Mackerel about. 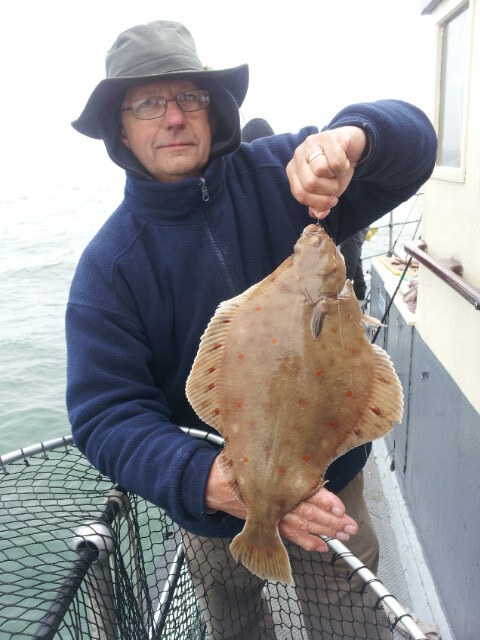 Sunday 13th, 54 nice fat Autumn Plaice for the lads with 12 returned, best fish around the 3lb mark. 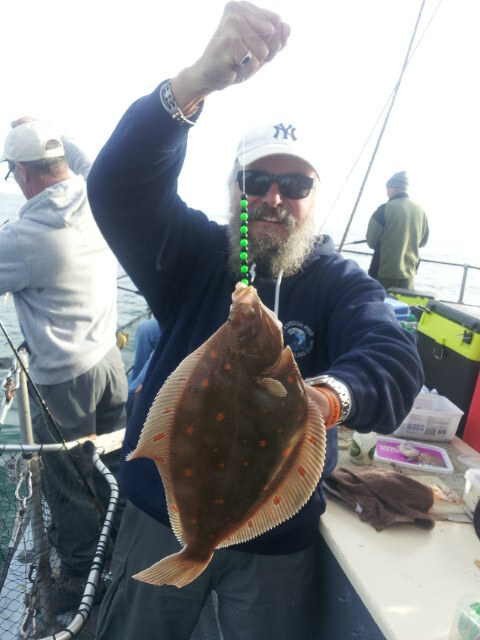 In spite of having some decent bookings for mid to late October we could not find a decent day's weather to take advantage of, and had to cancel every booking. 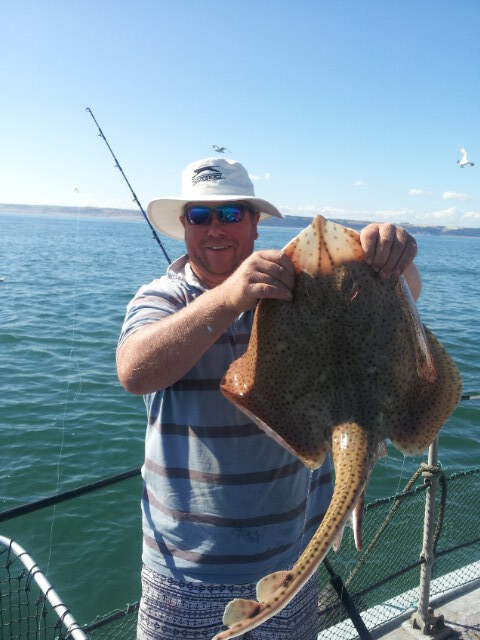 Last year we enjoyed some cracking weather through to the end of October. 2013 has not been kind to us. November 13th. 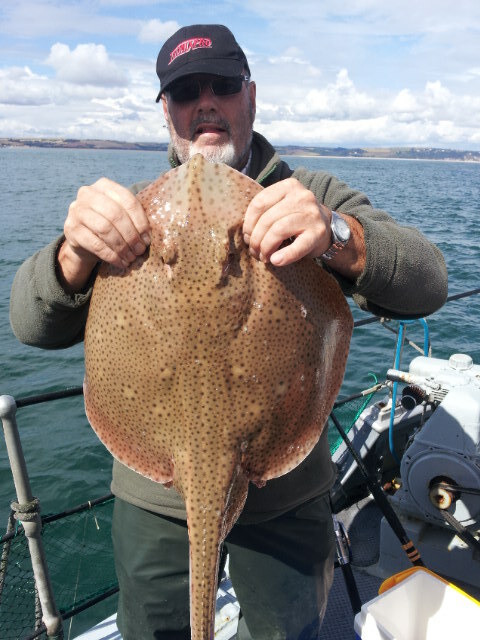 We have not been able to get out for 4 weeks, with winter looming this is so frustrating with the fishing still very good when we do get out there. 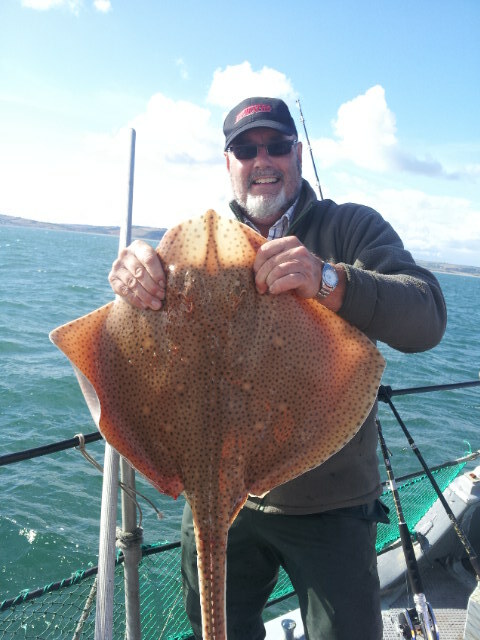 So what do you get when you find a group of good anglers, give them some decent bait, and a days good weather in the middle of November, well the answer is 95 cracking Plaice, some big smiles and some well contented fishermen. 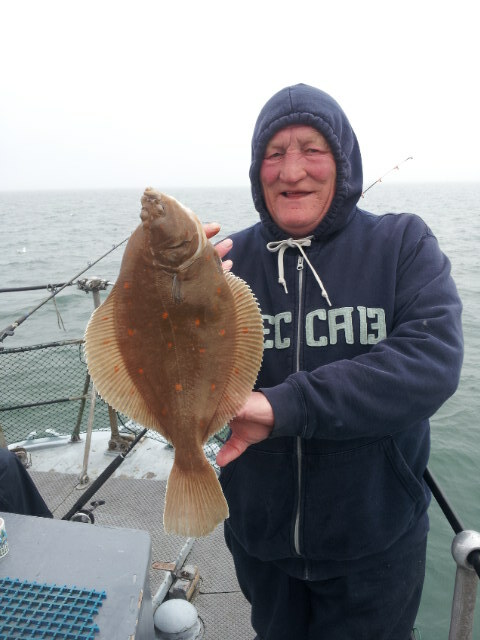 Best Plaice was around the 3 1/2lb mark, again with plenty over the 2lb. 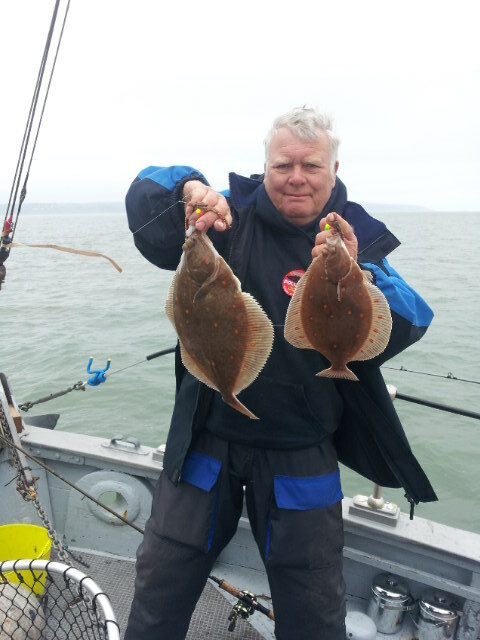 These Autumn fish are in their best condition now as they get ready to go off and spawn. Just how much longer they will be around for we will have to wait and see. 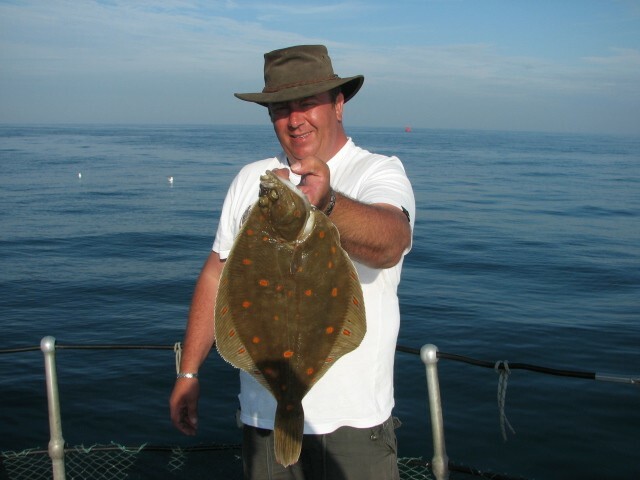 I hope we can have a few more days fishing for them before this years Plaice fishing draws to a close. It makes for a long winter when they have gone.